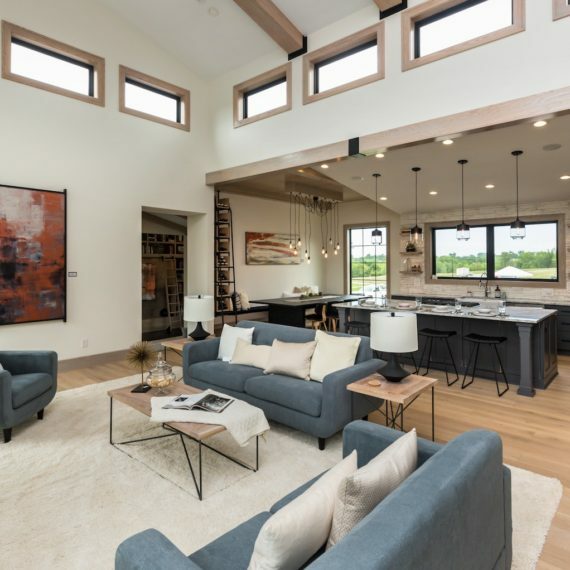 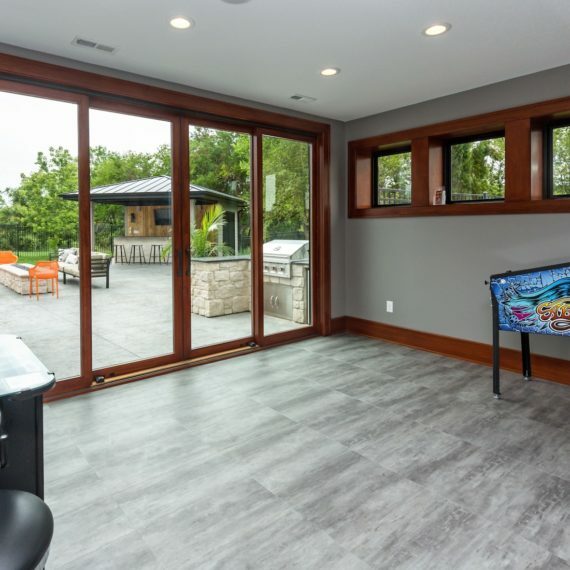 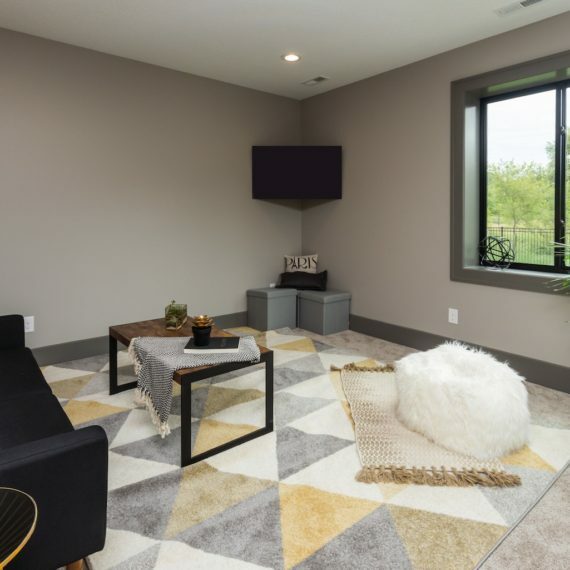 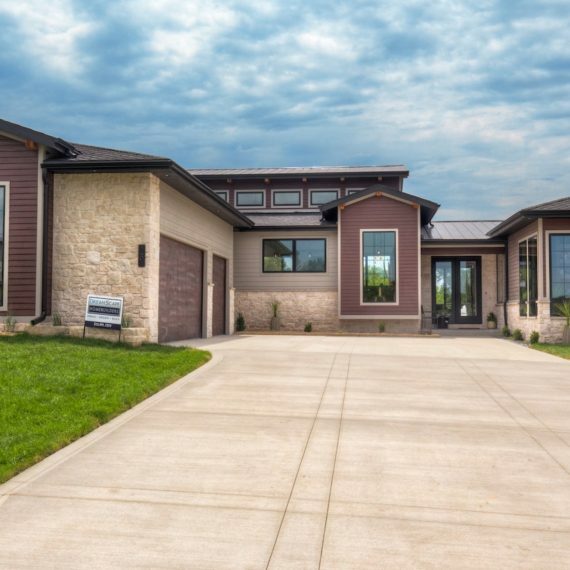 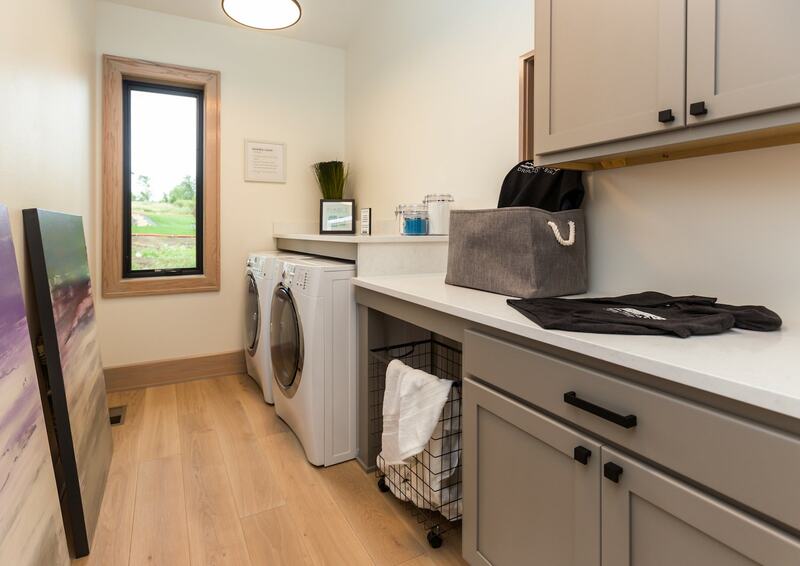 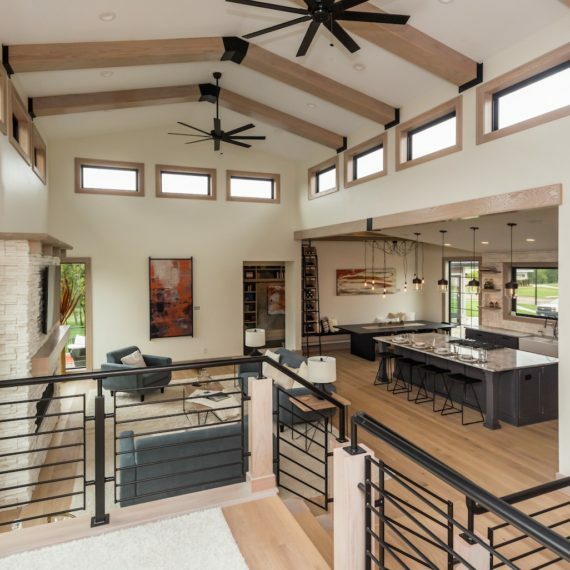 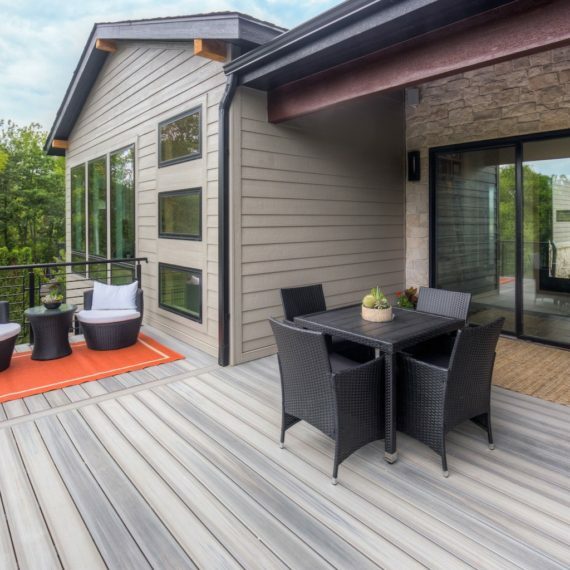 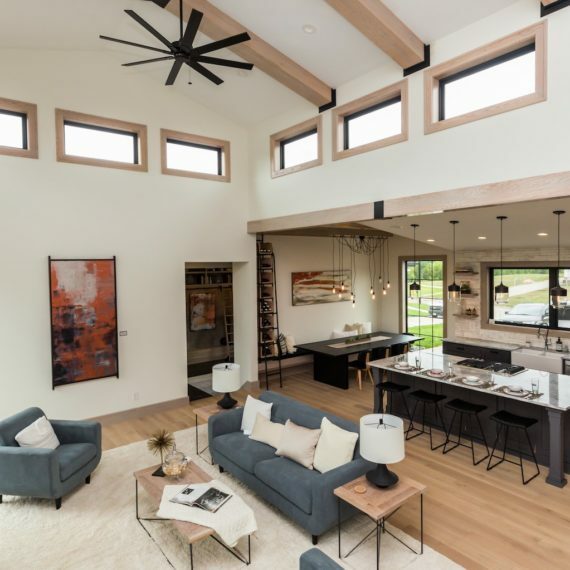 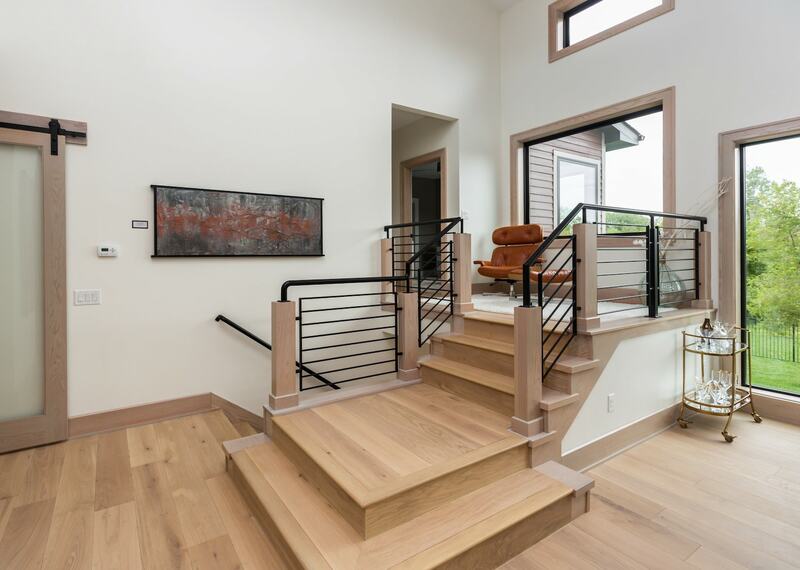 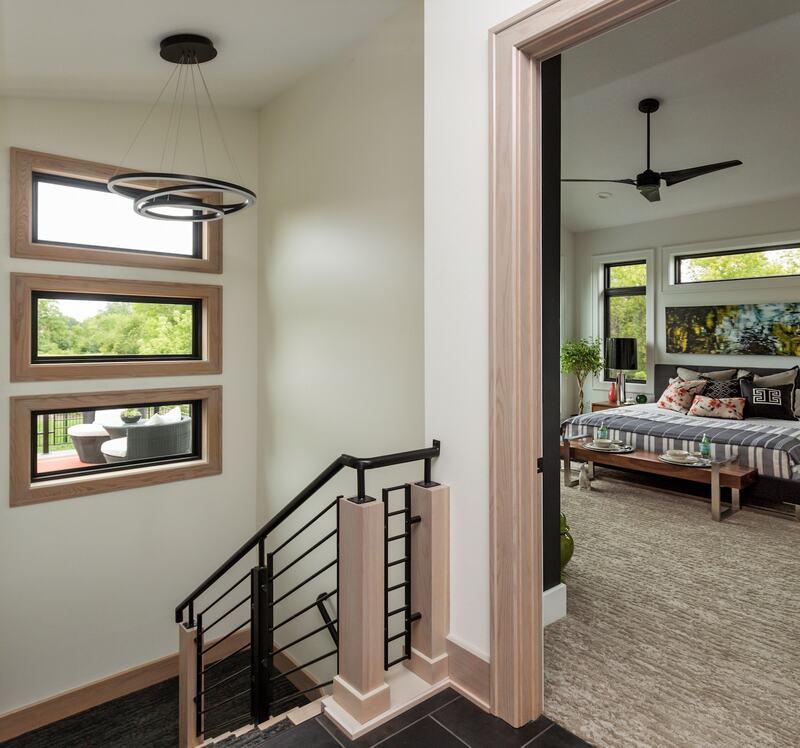 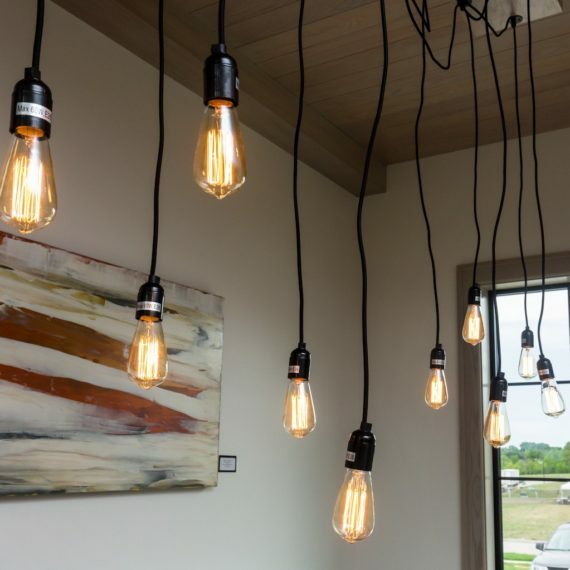 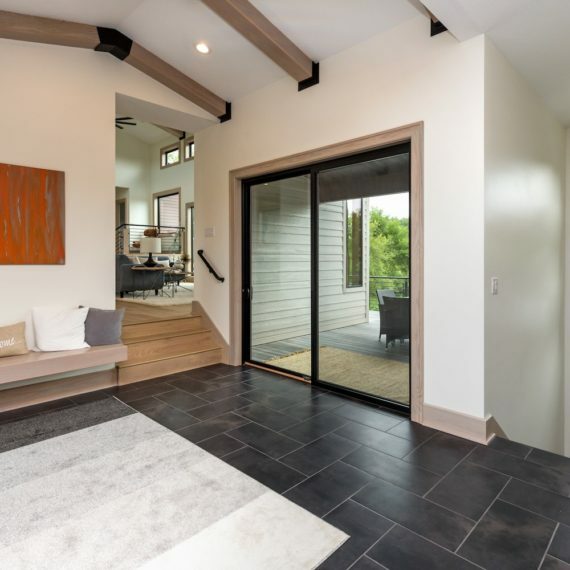 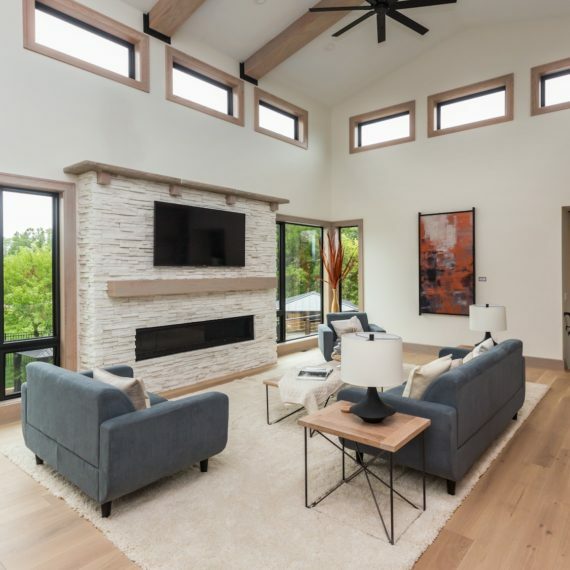 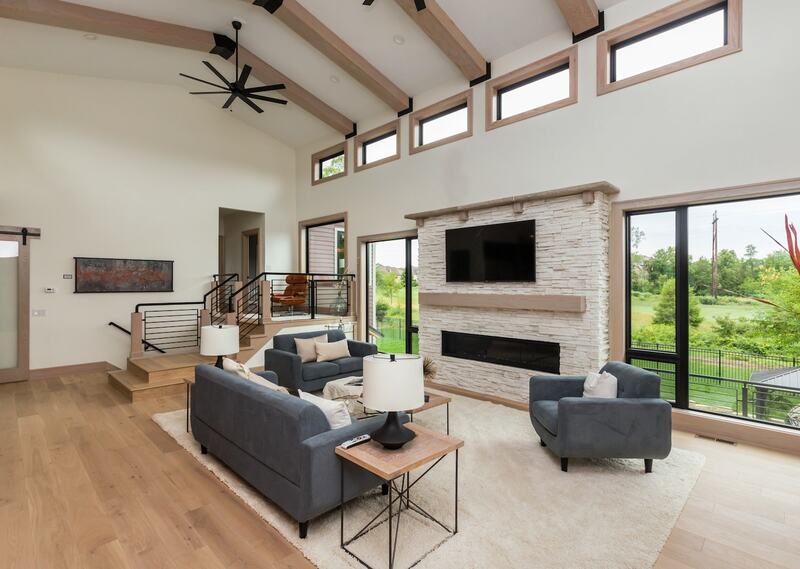 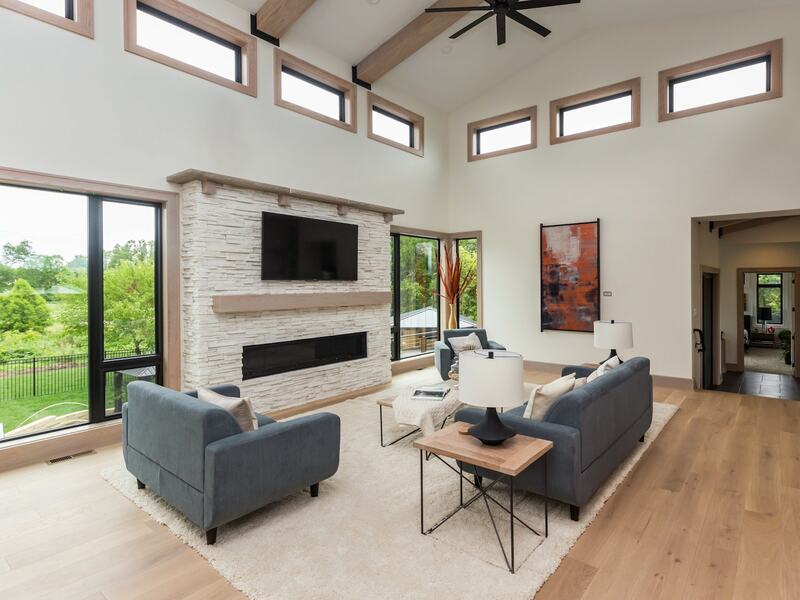 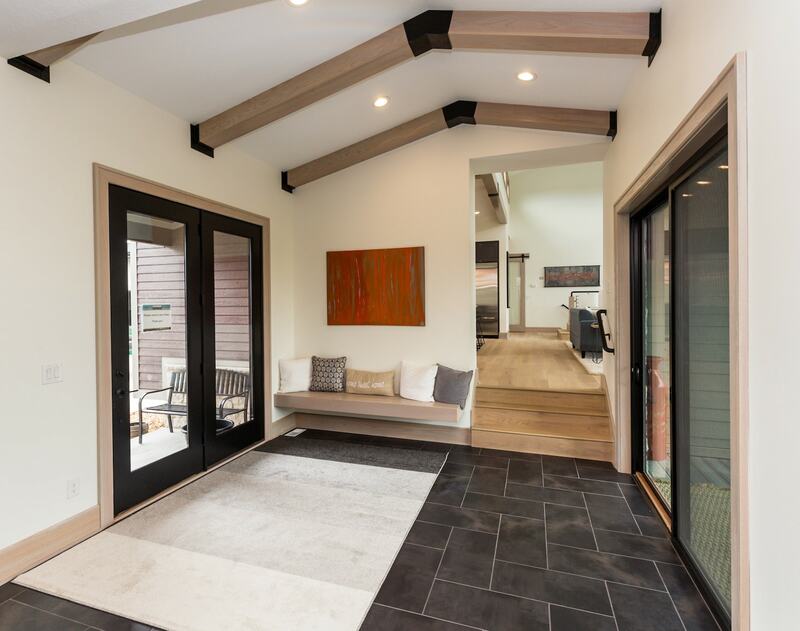 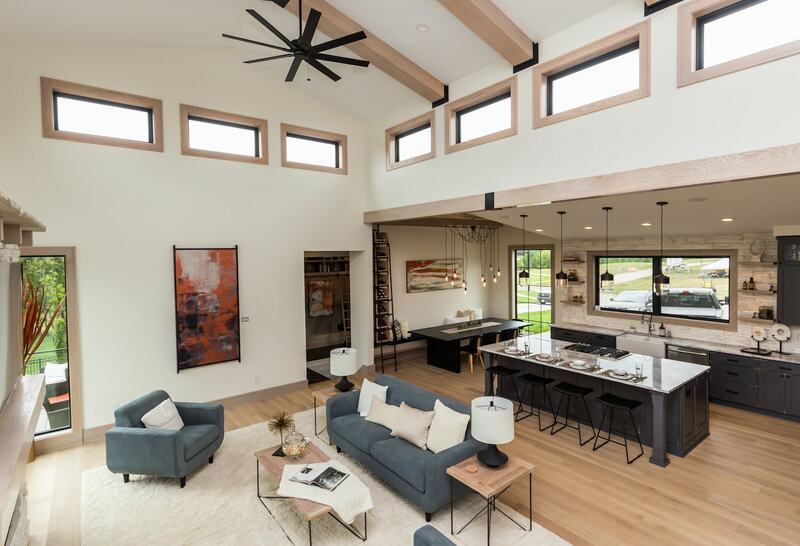 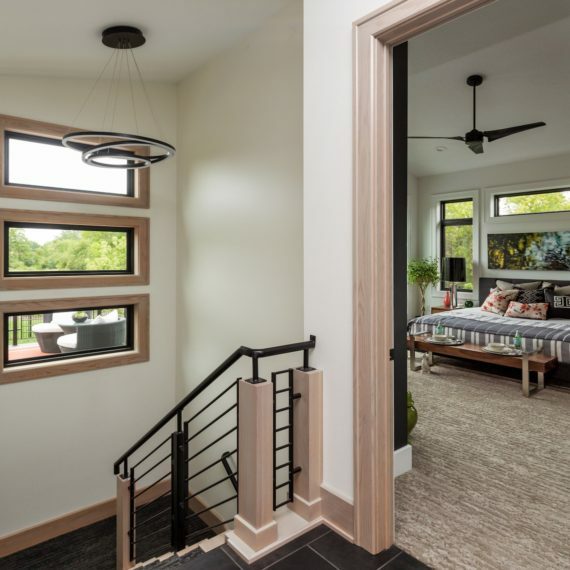 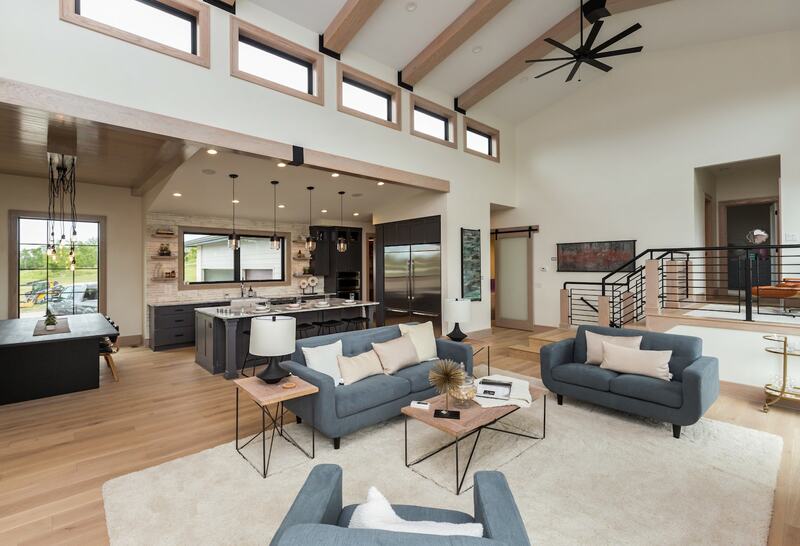 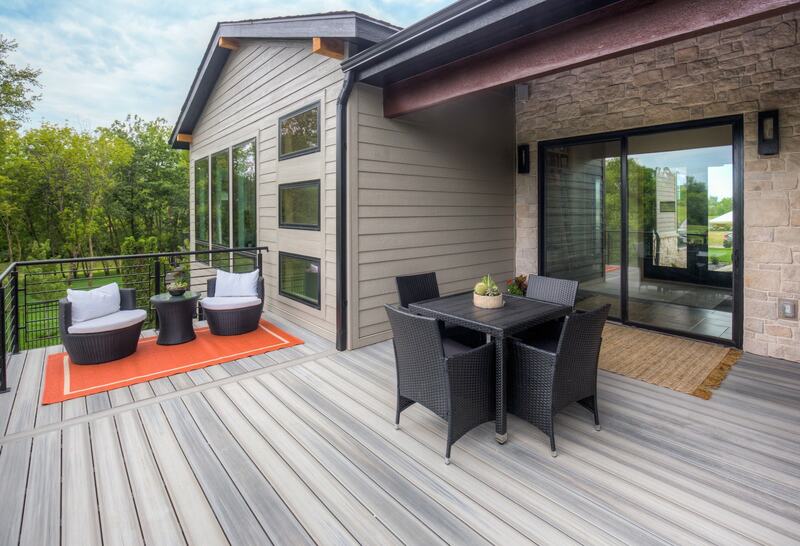 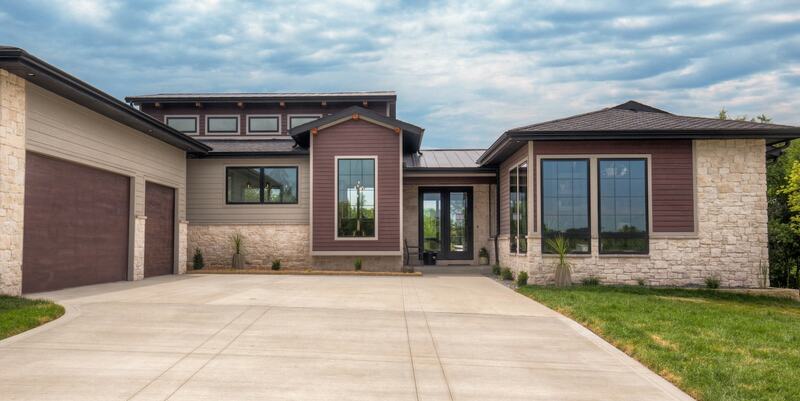 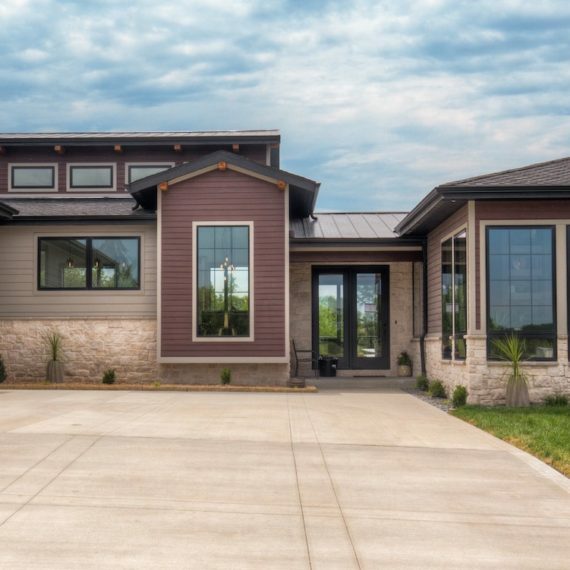 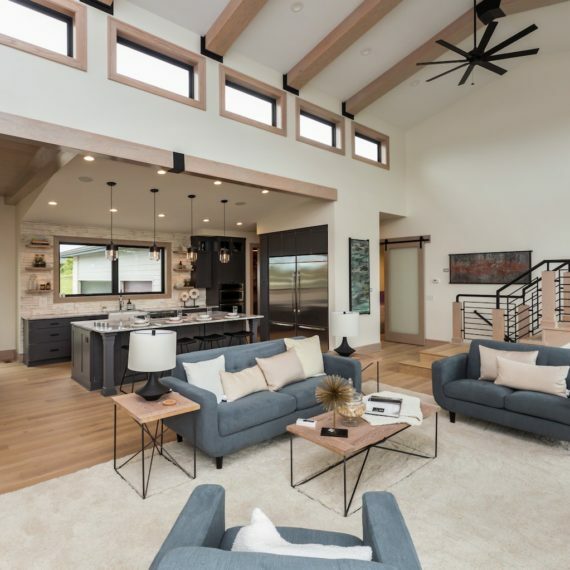 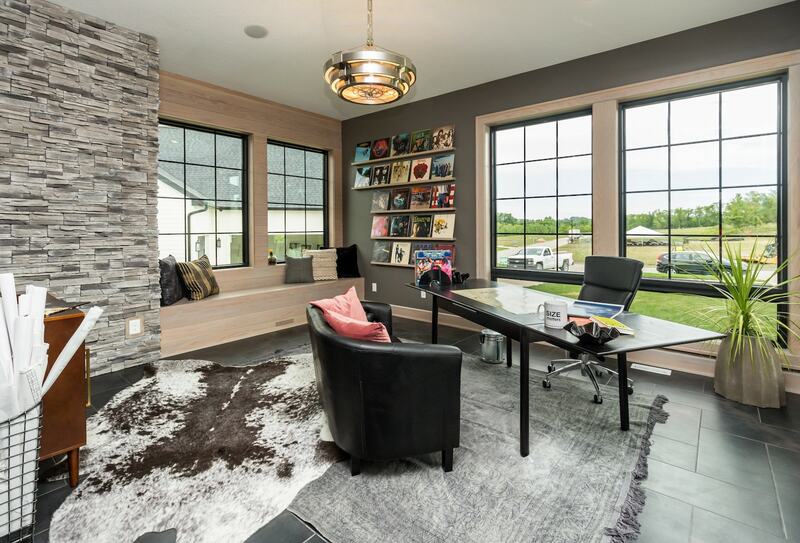 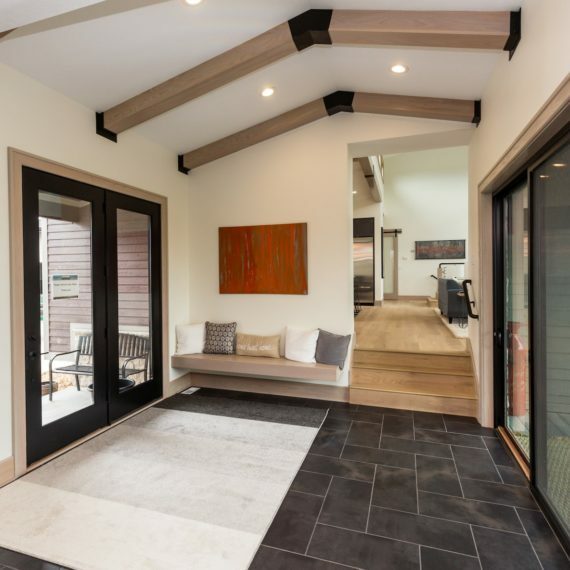 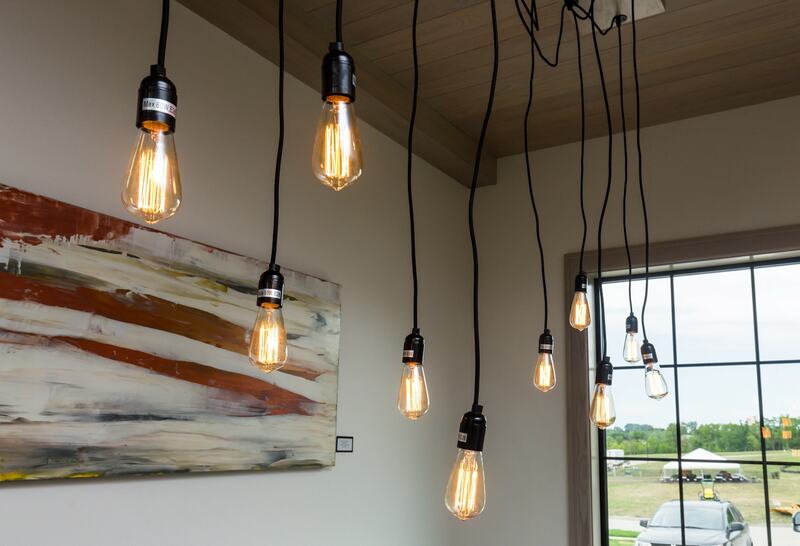 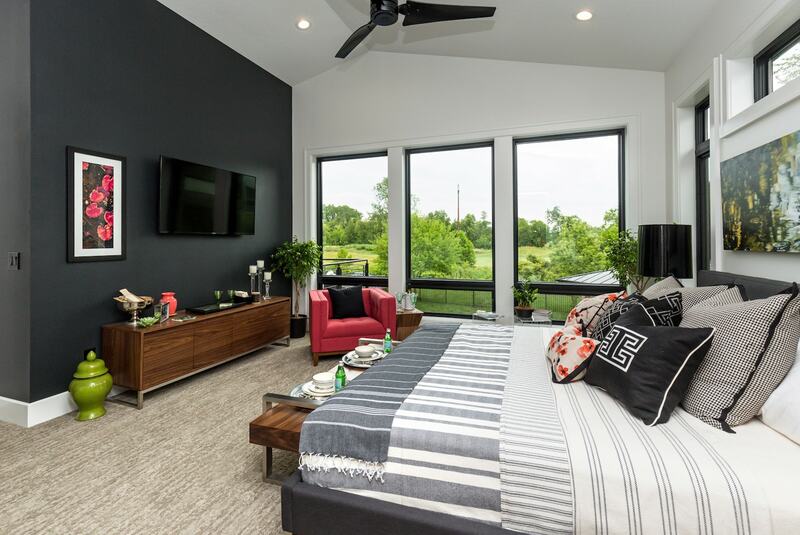 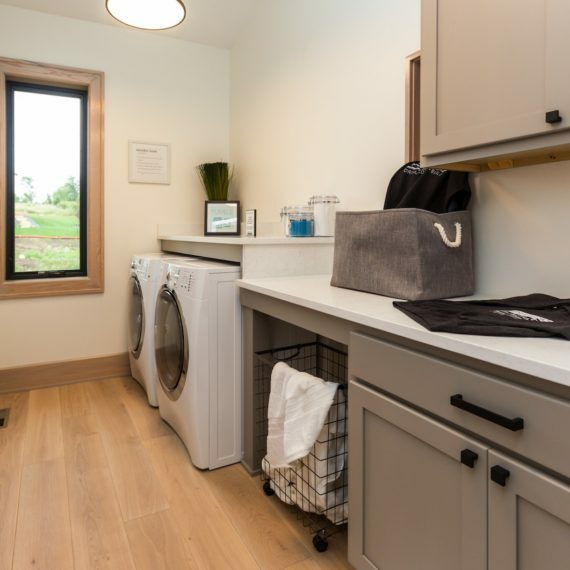 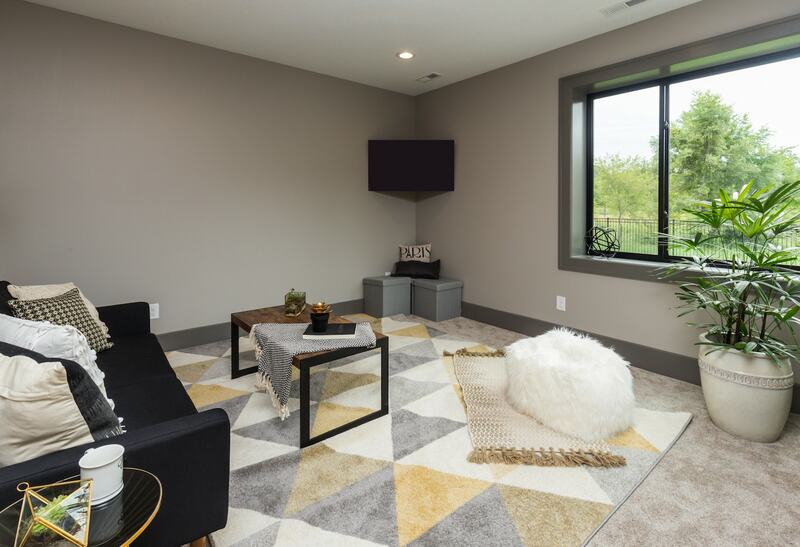 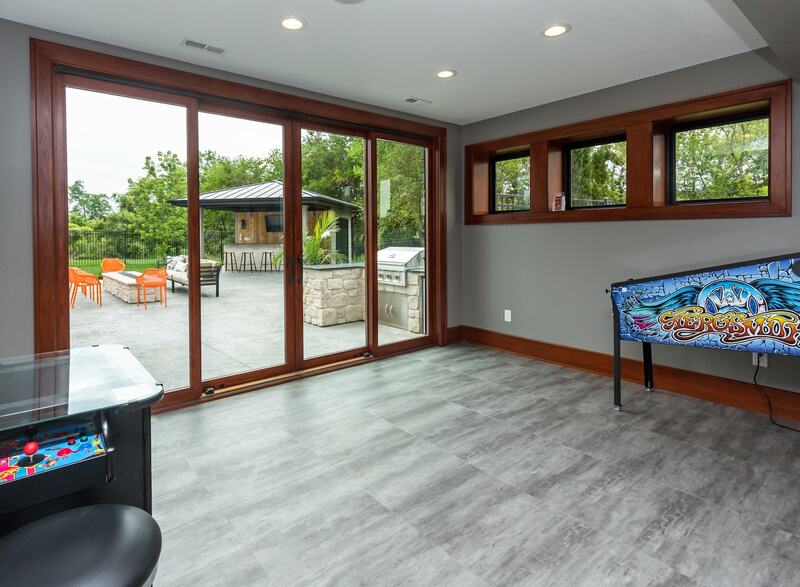 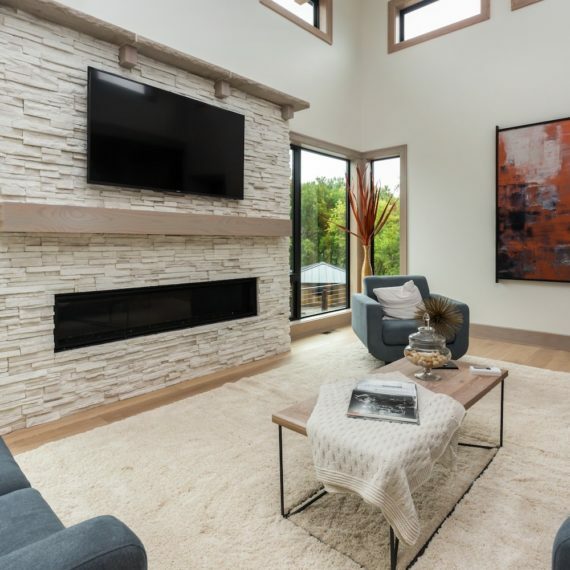 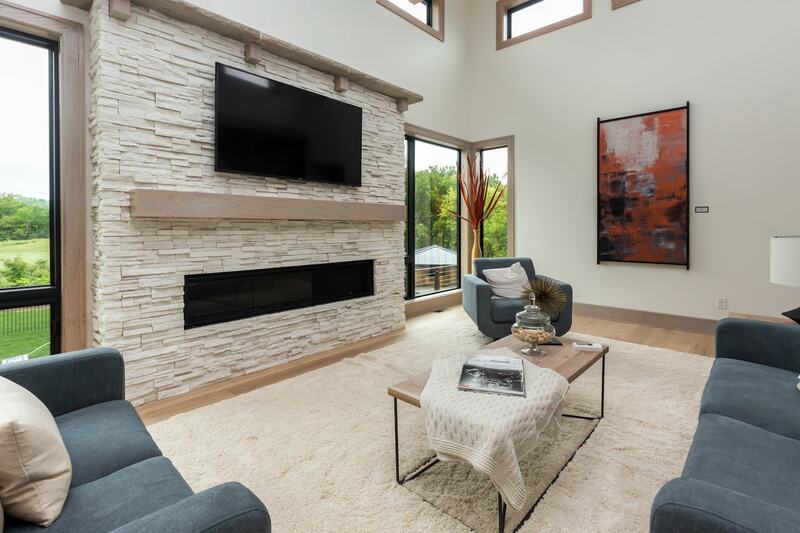 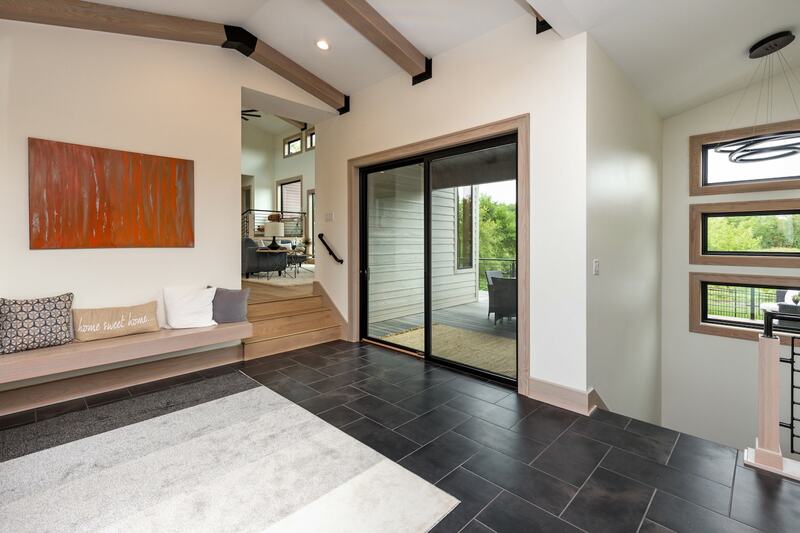 Dreamscape Homebuilders returns with this California inspired ranch hybrid that features a modern, industrial, beach infused design with 5,000 sq ft of finish. 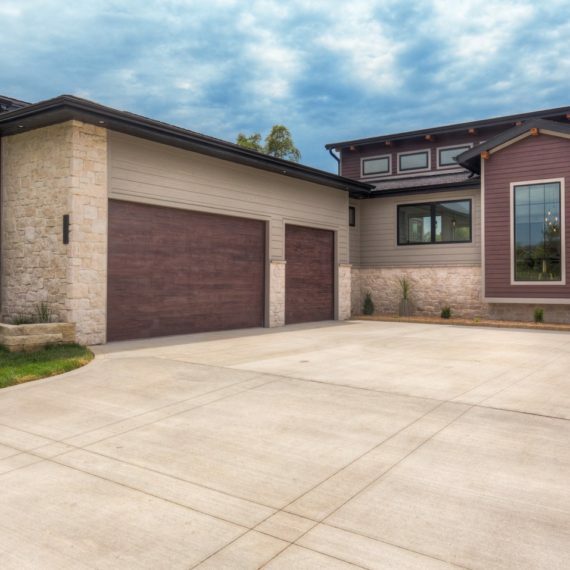 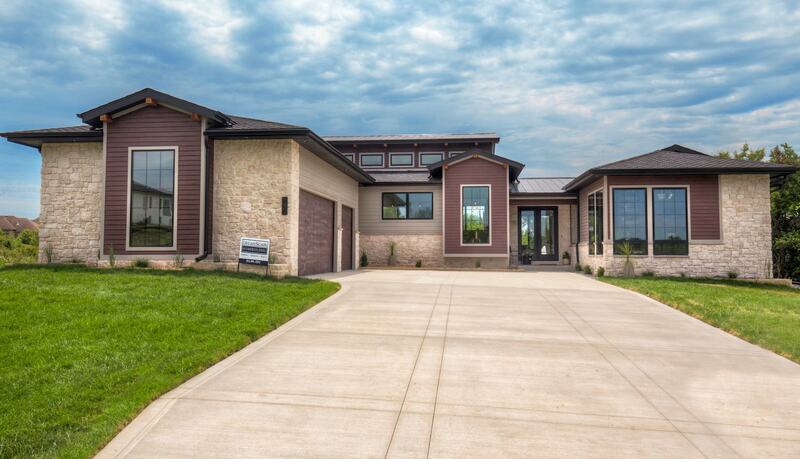 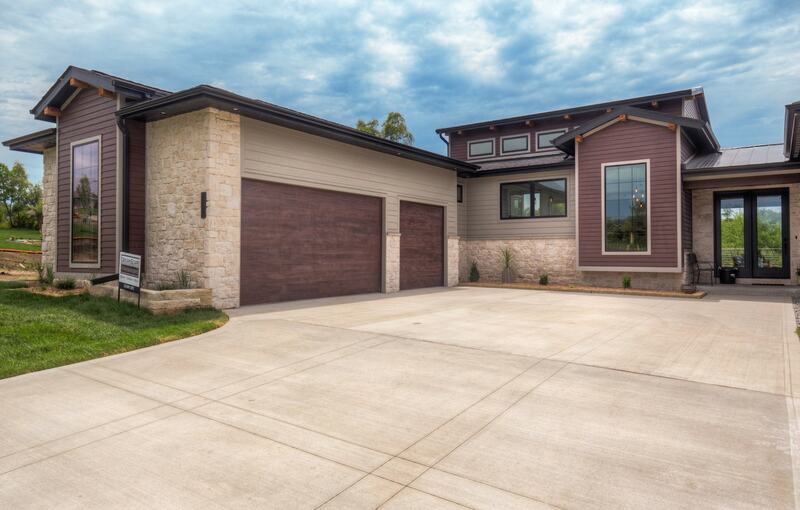 The Napa Valley/Malibu inspired exterior features a 3 car courtyard garage with contemporary cedar and stone accents. 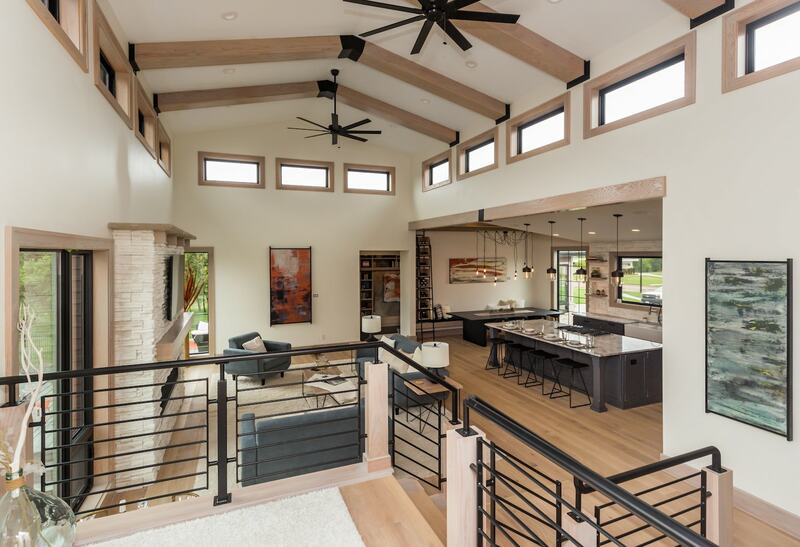 You’ll appreciate the architecture of this plan with the many vaults, angles and beams in the living room, kitchen, master and mud room ceilings in addition to the subtle multi-levels of the entry/master, living/kitchen and raised level BRs. 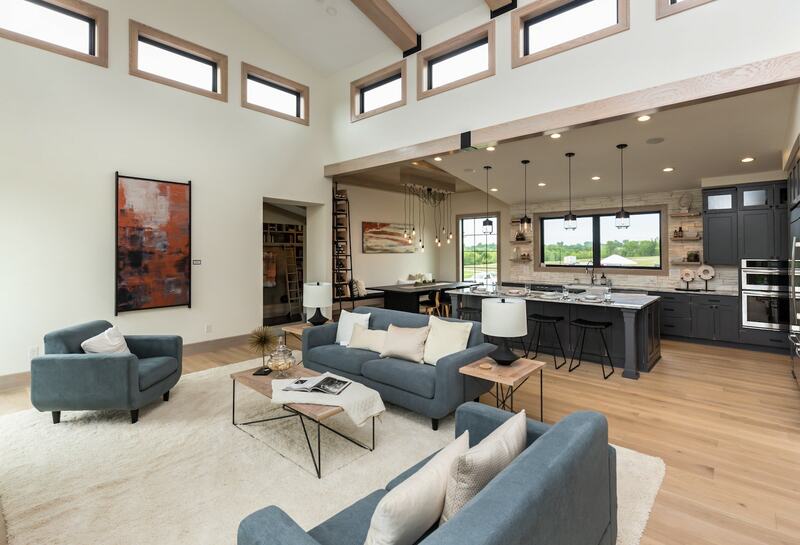 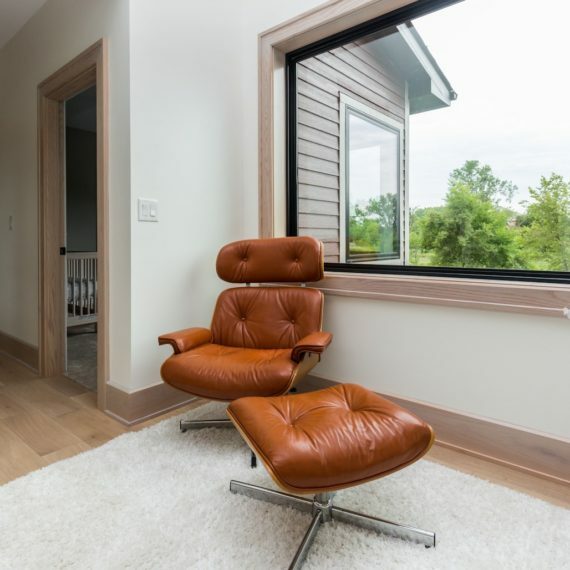 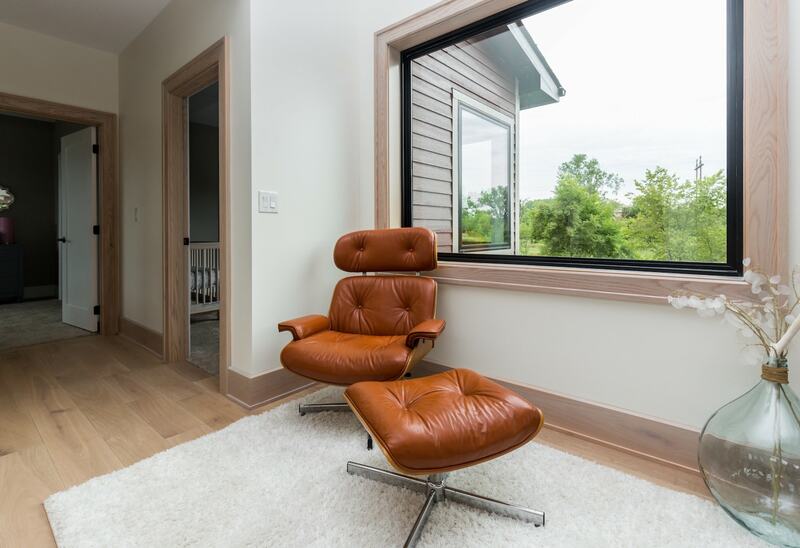 With an abundance of windows, this home has plenty of natural light and maximizes the views of the front and backyard. 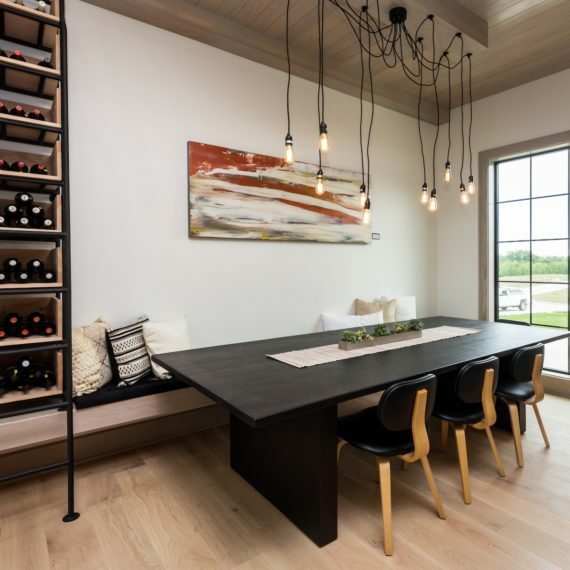 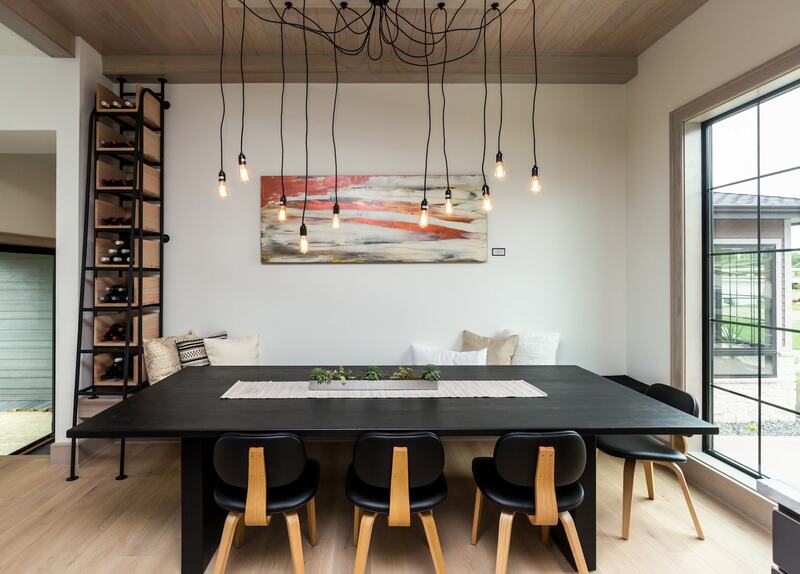 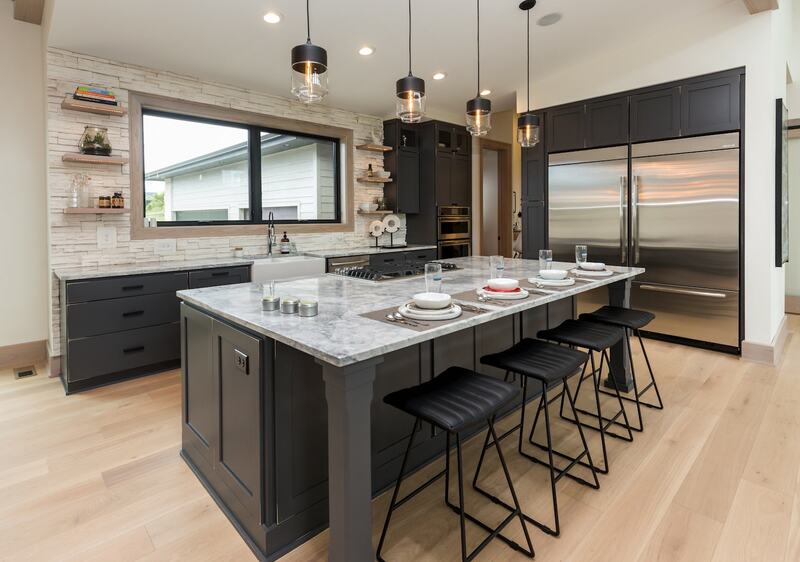 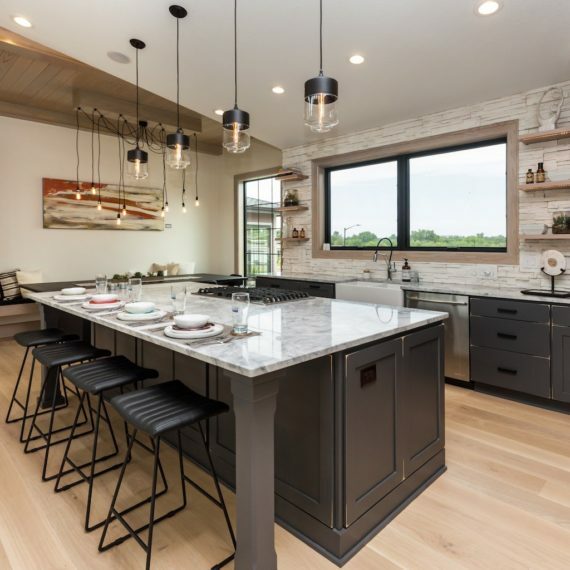 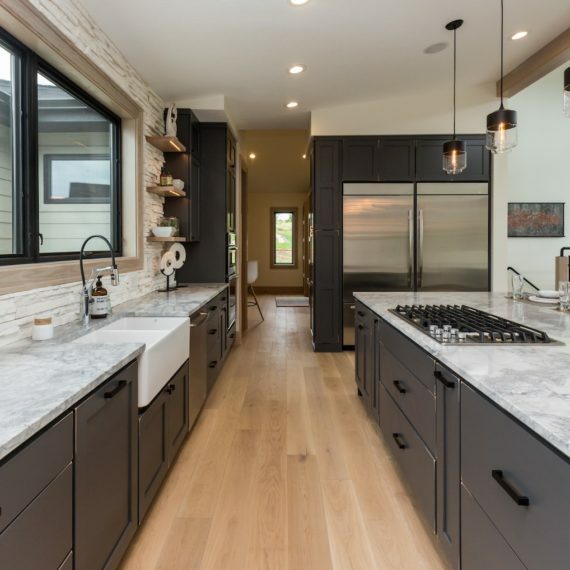 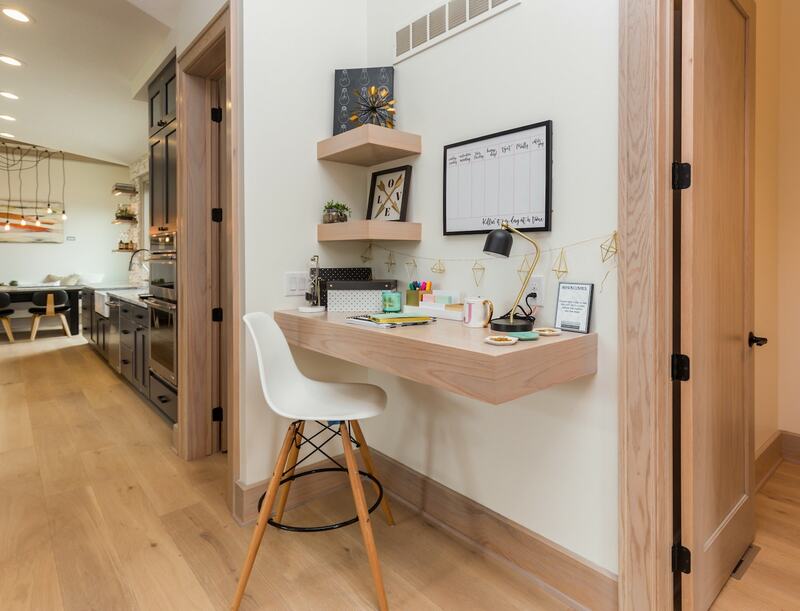 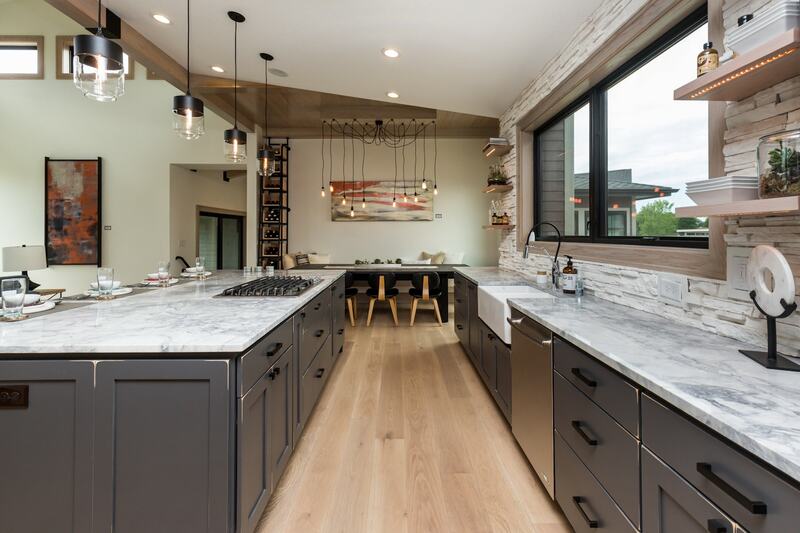 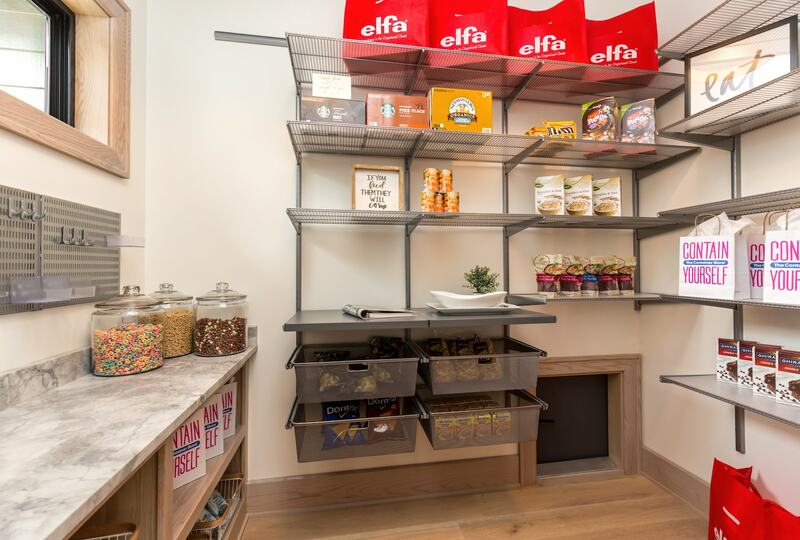 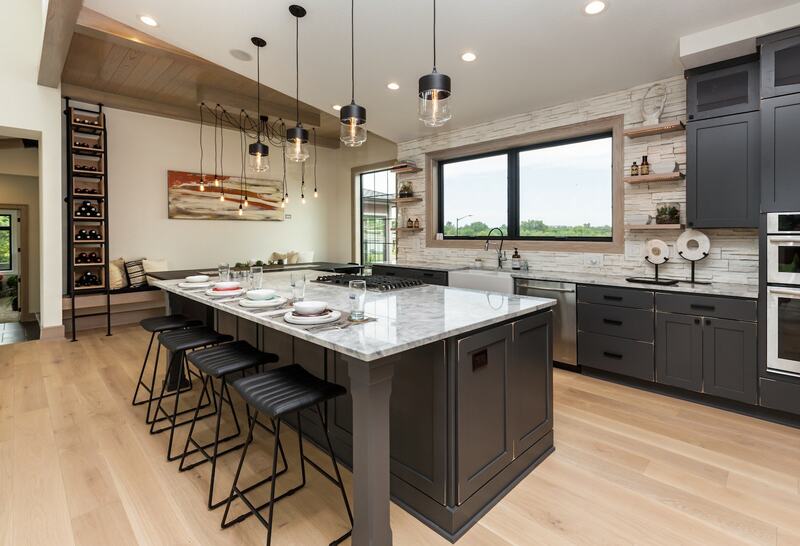 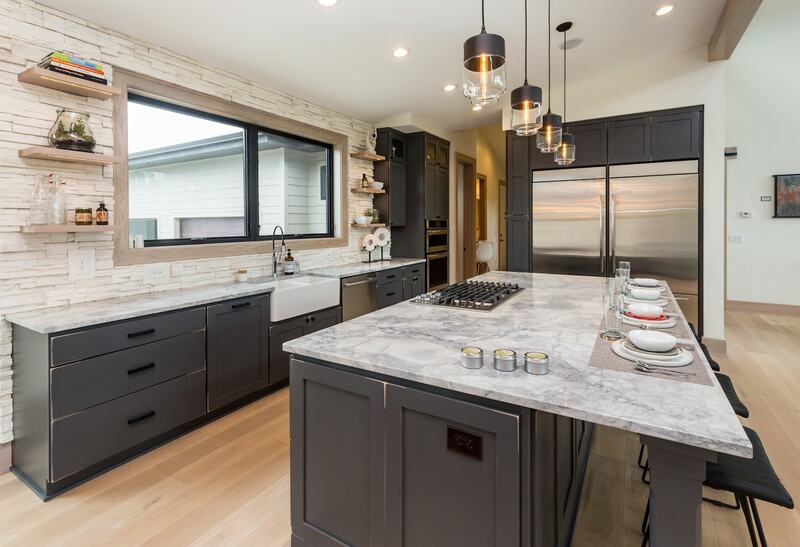 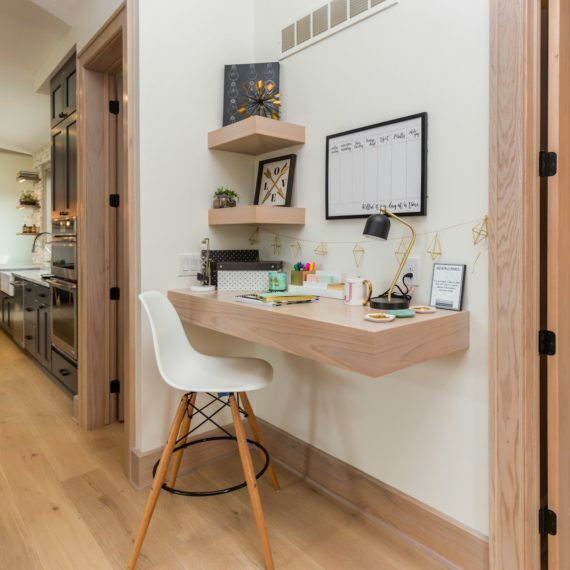 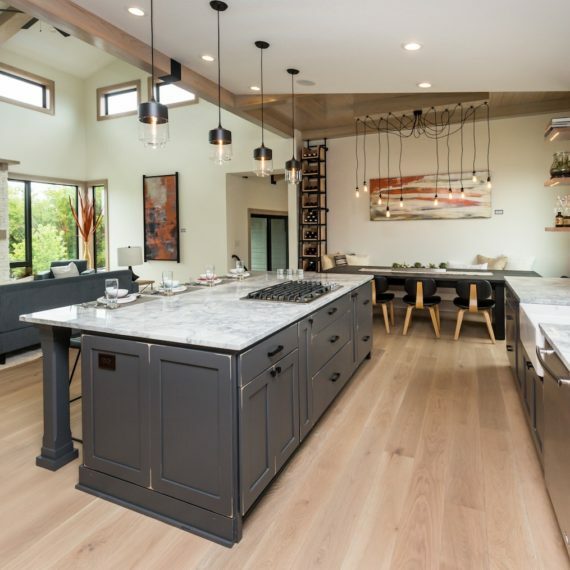 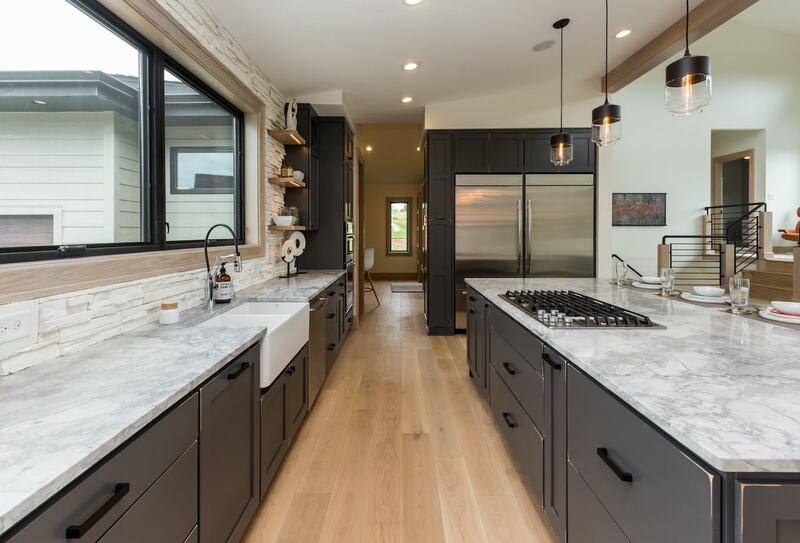 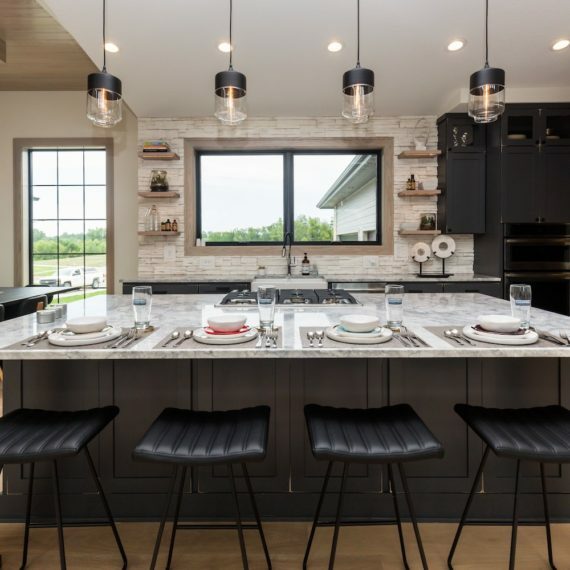 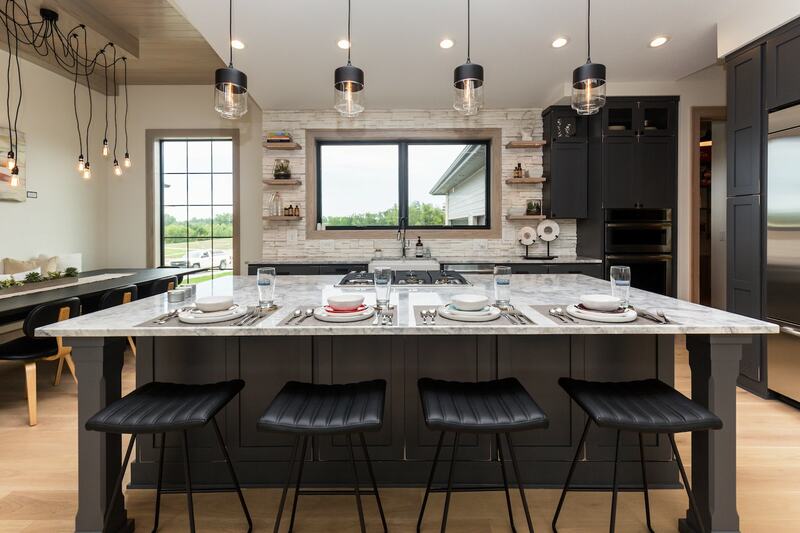 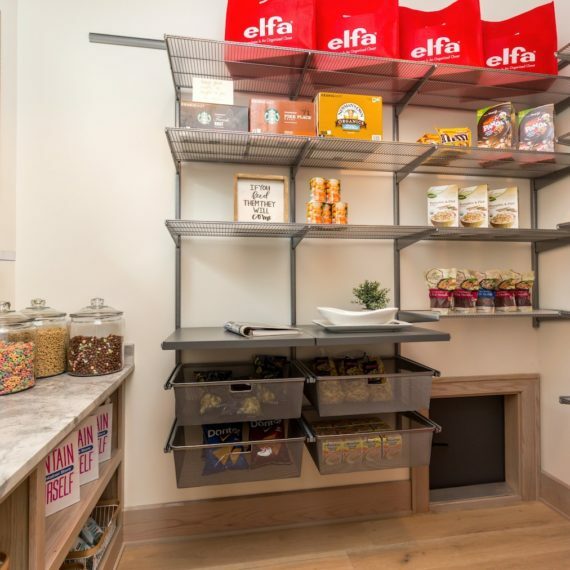 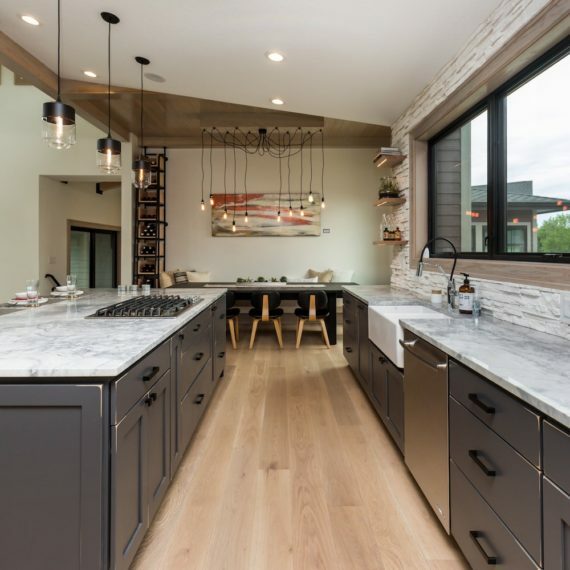 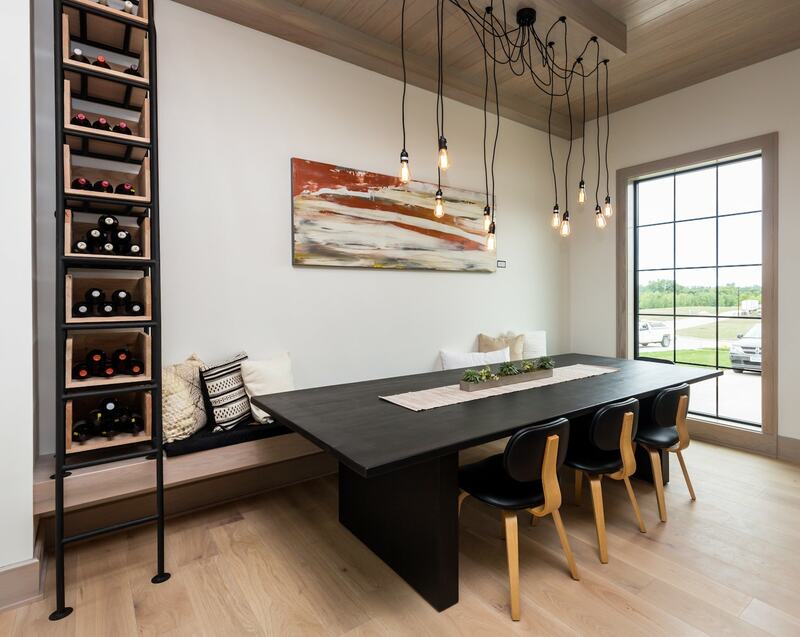 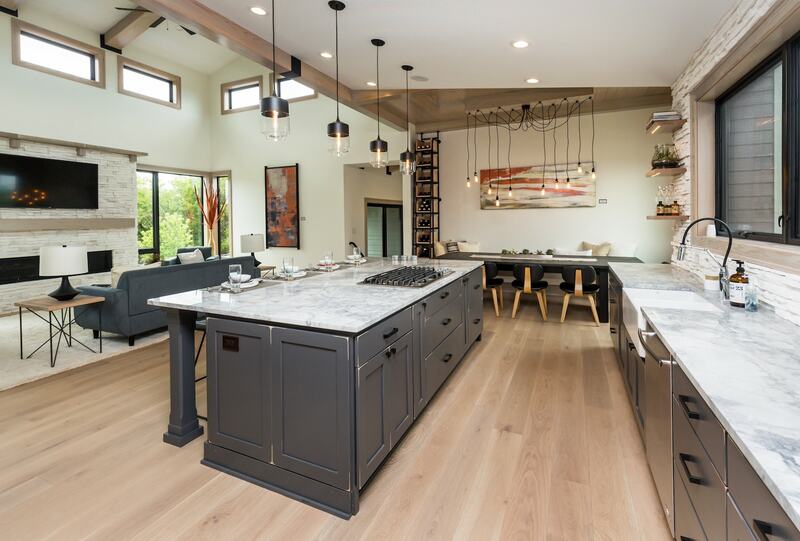 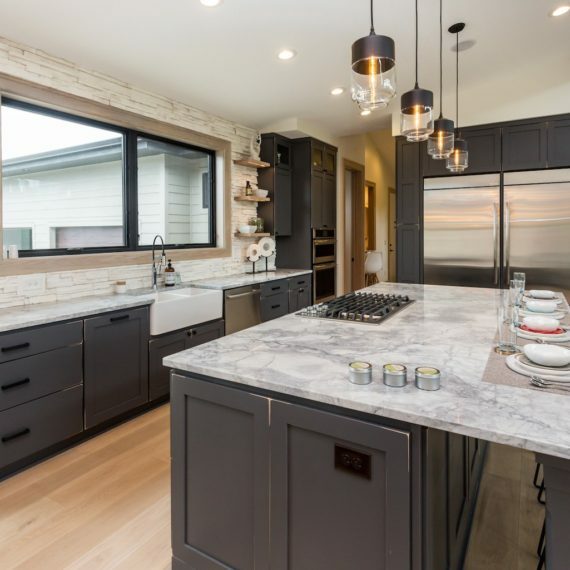 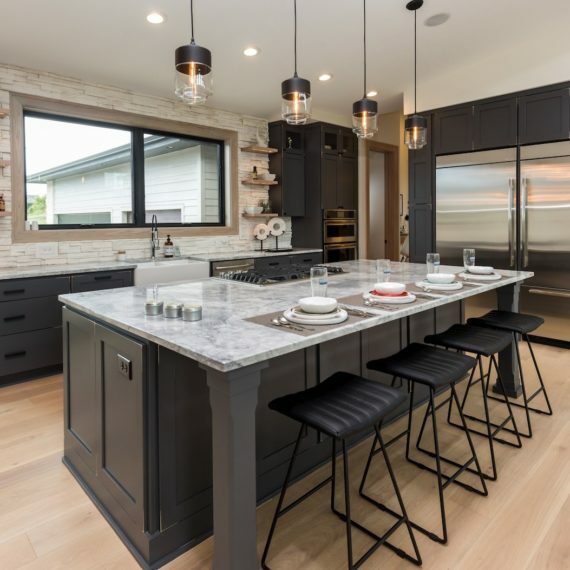 The industrial-chic kitchen features an island for 6, large eat-in dining bench, walk-in pantry, double fridge/freezer, wall oven, island cook top, custom wine rack and open shelving. 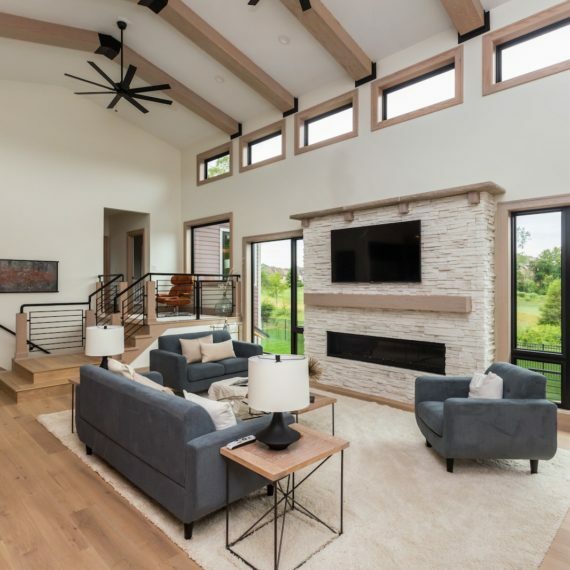 The living room vaults to the heavily windowed roof dormer and is filled with large wall windows, a 6 ft linear fireplace with stone and distressed mantle, ceiling beams and a great view of the backyard. 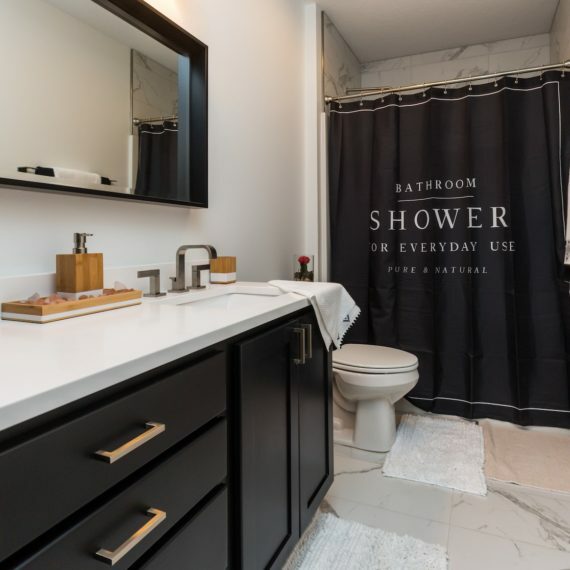 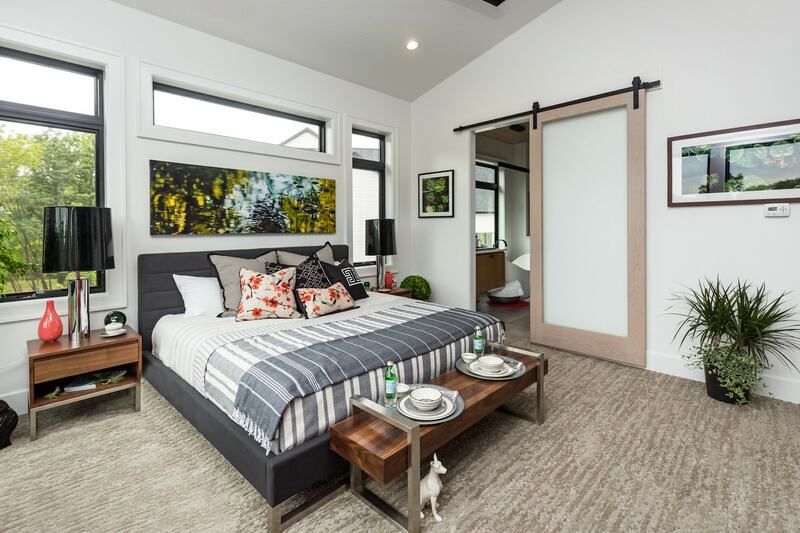 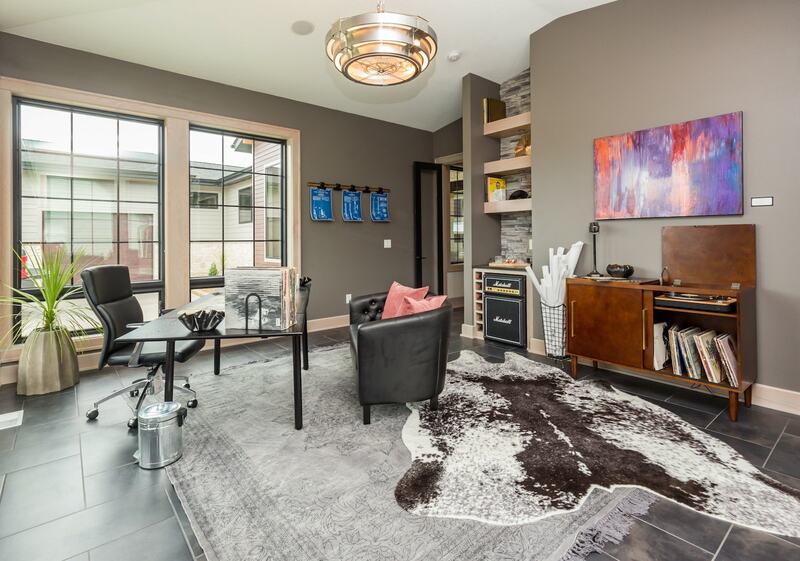 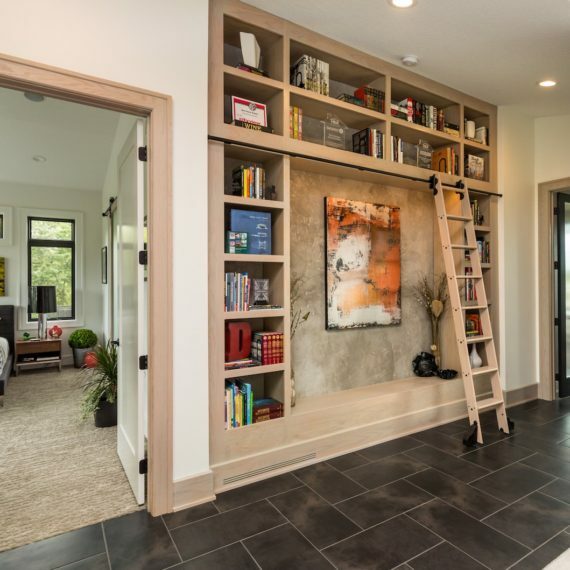 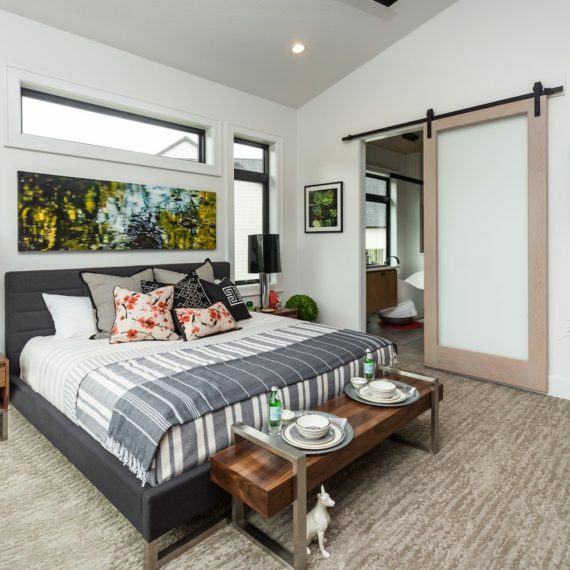 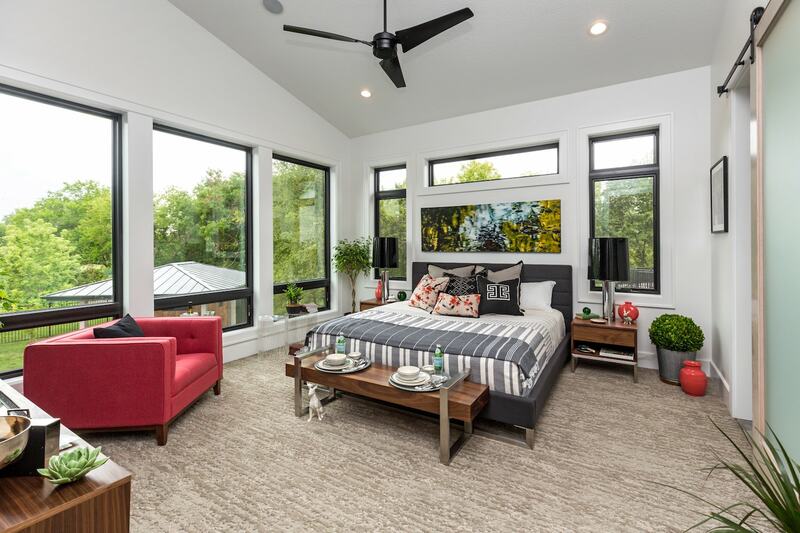 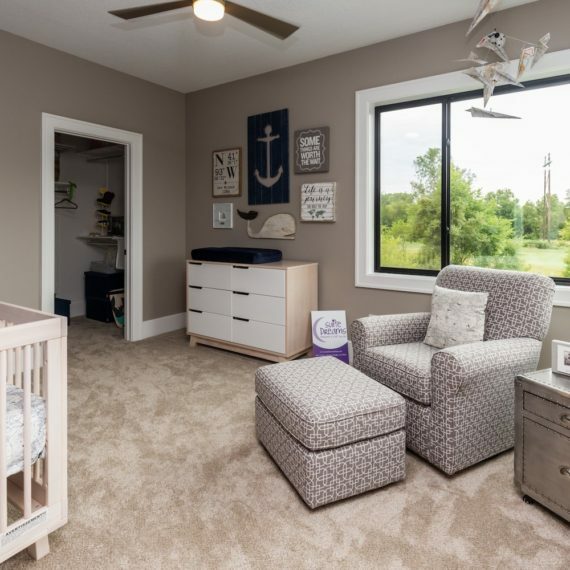 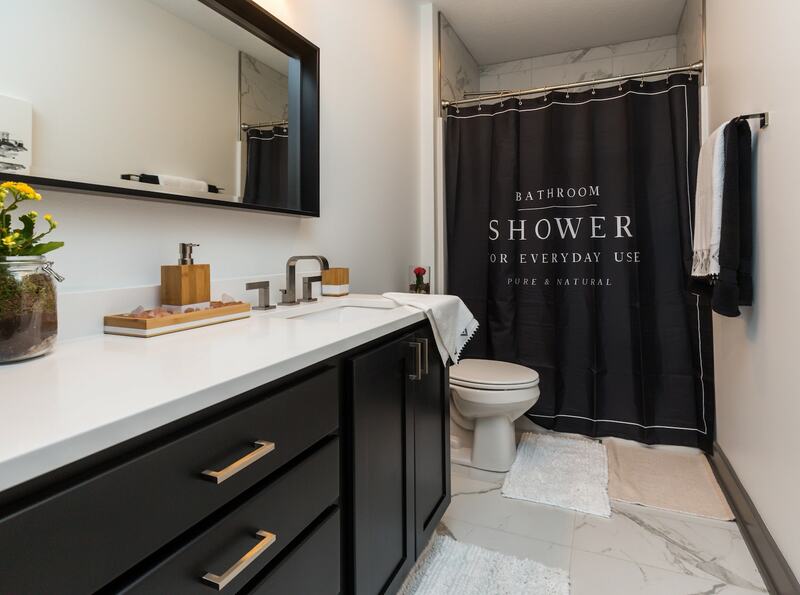 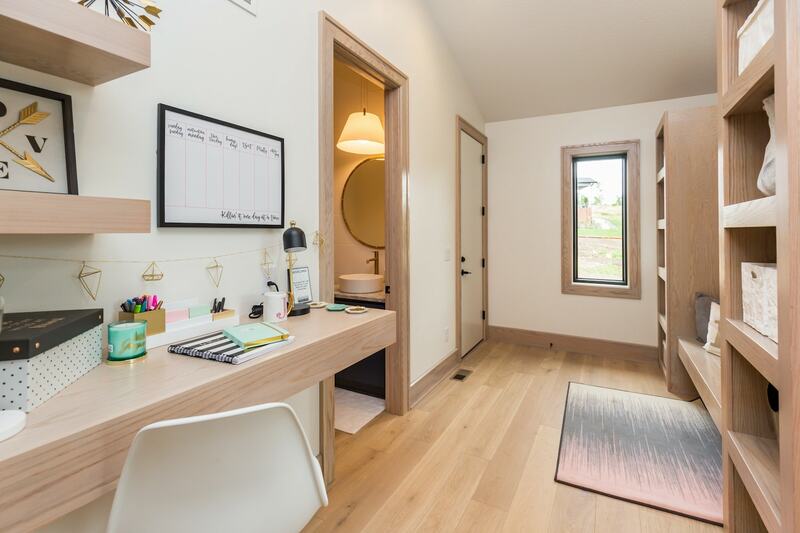 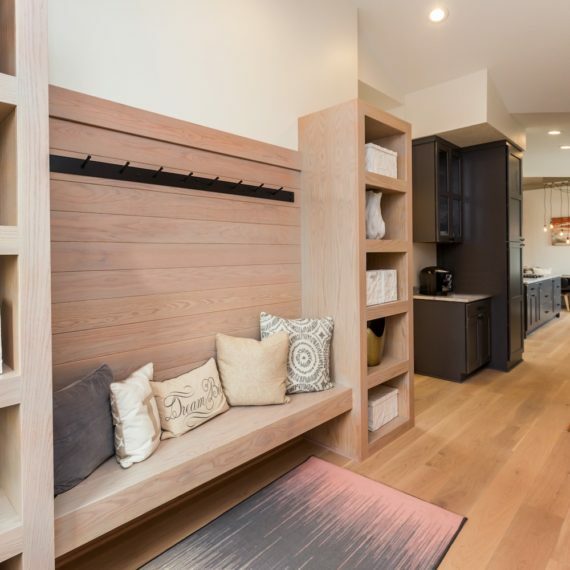 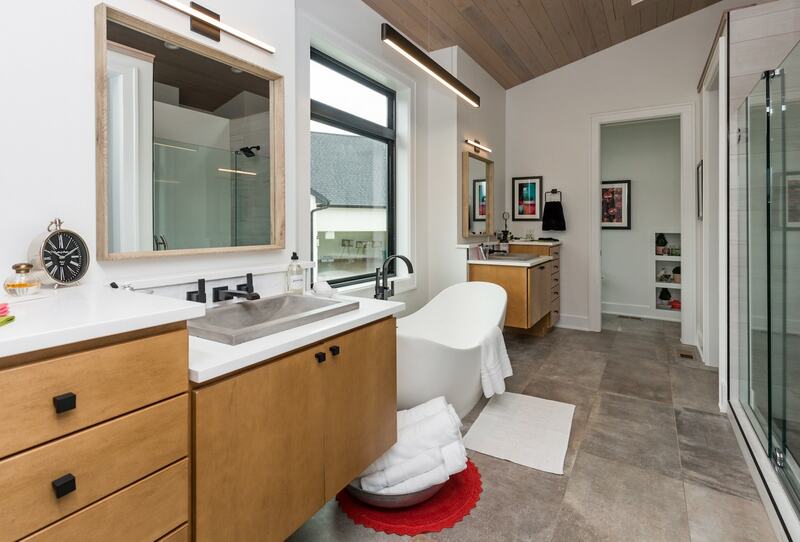 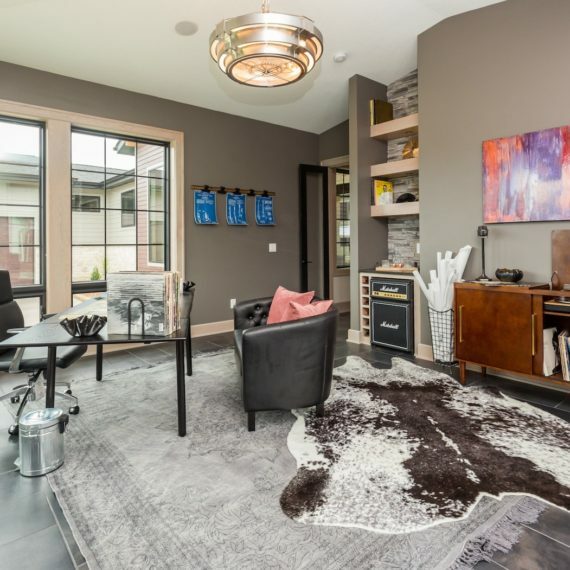 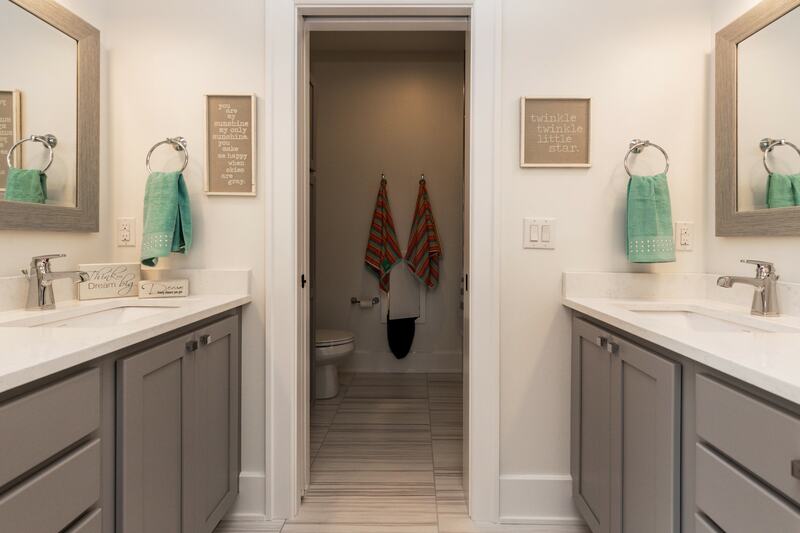 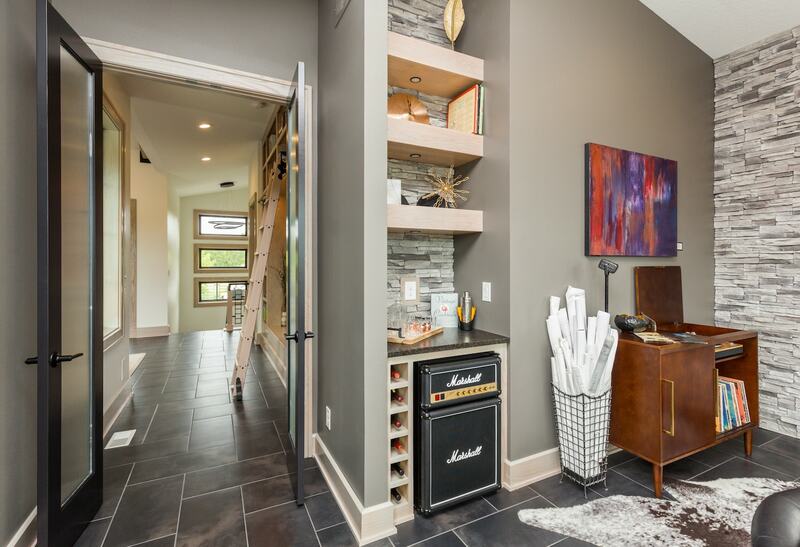 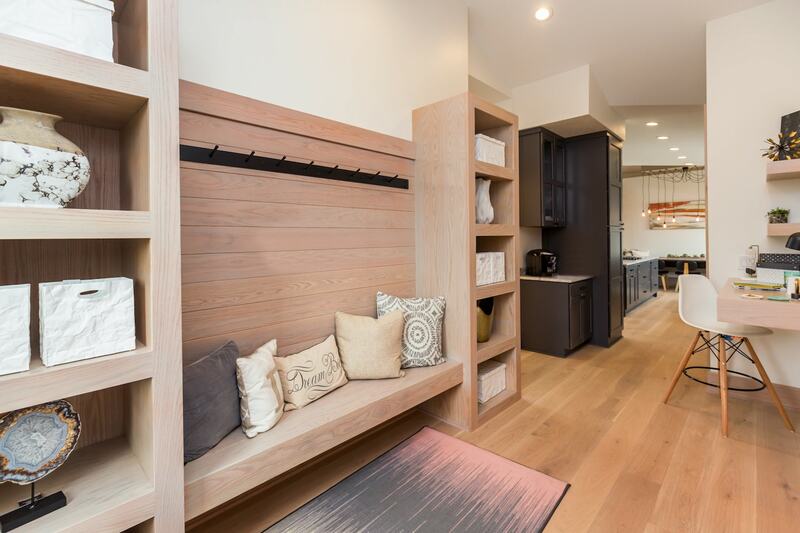 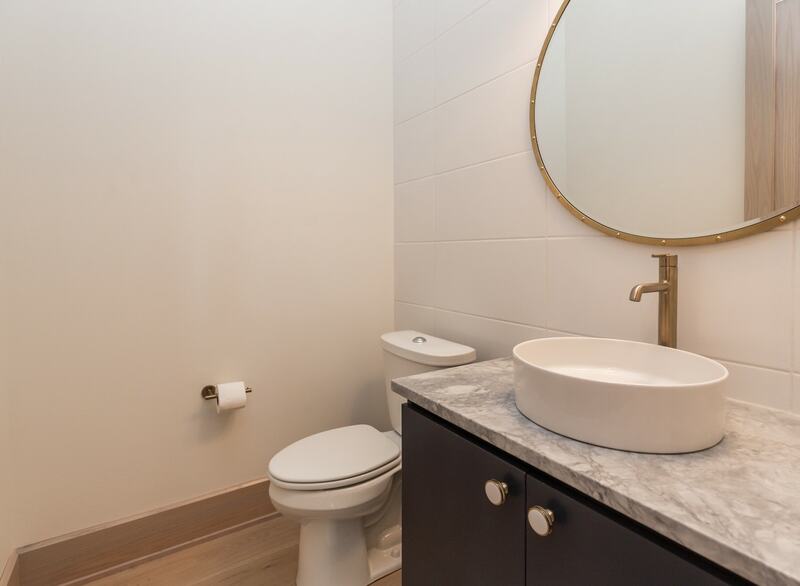 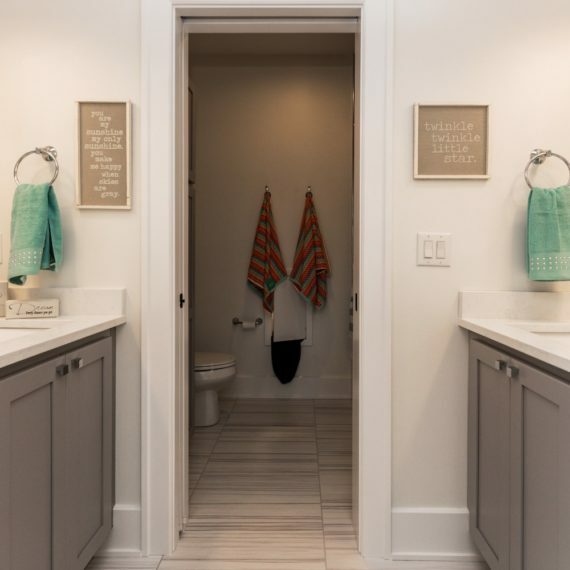 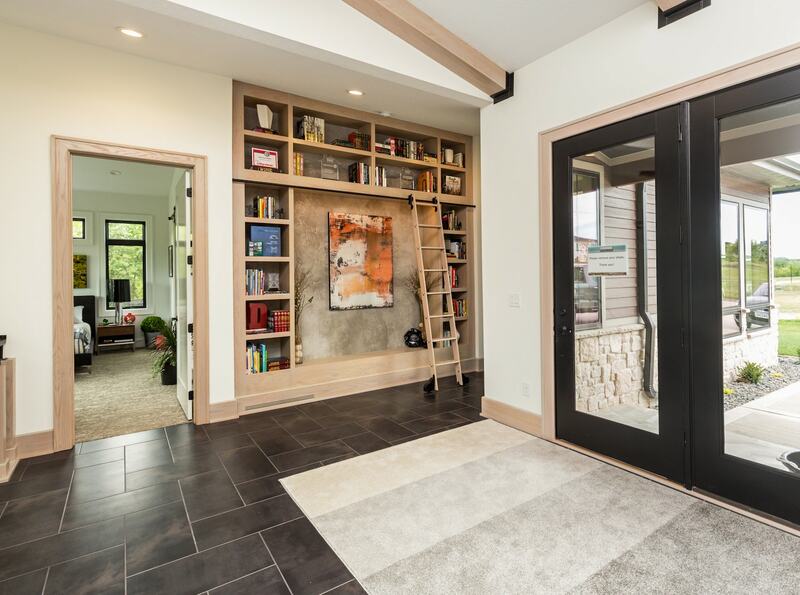 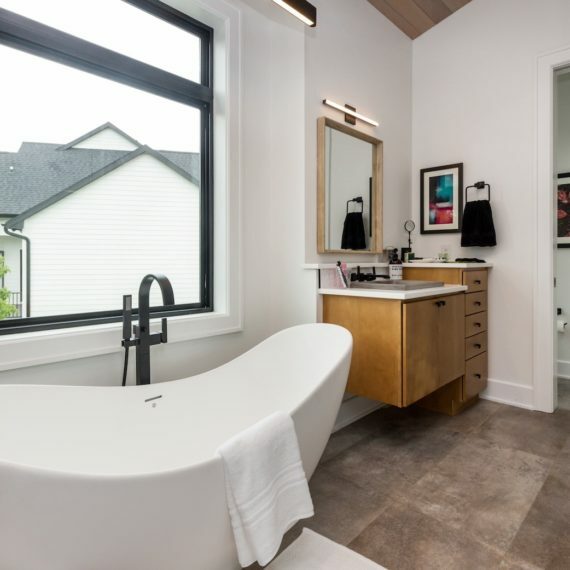 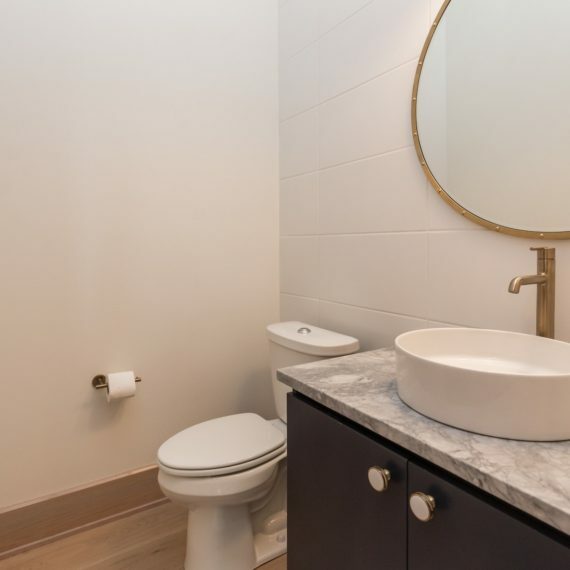 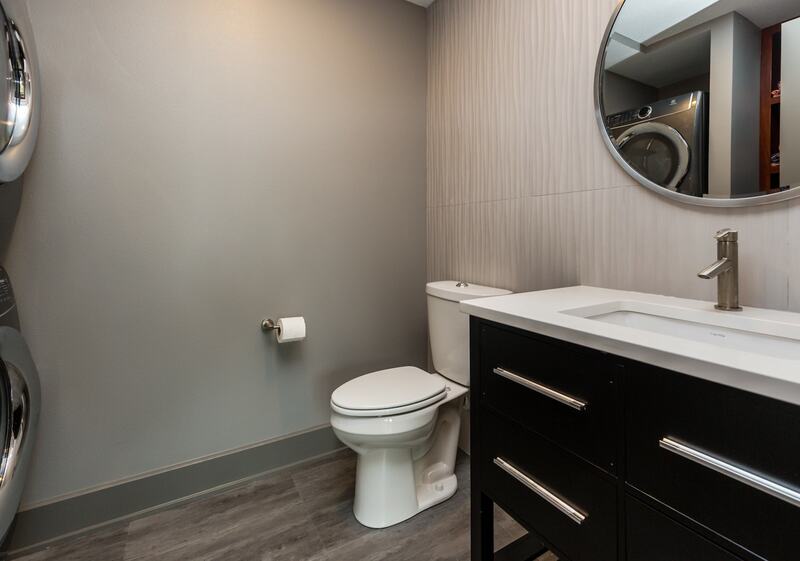 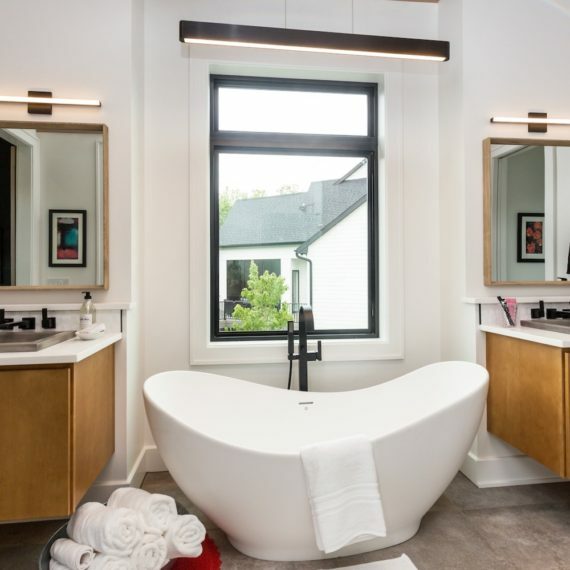 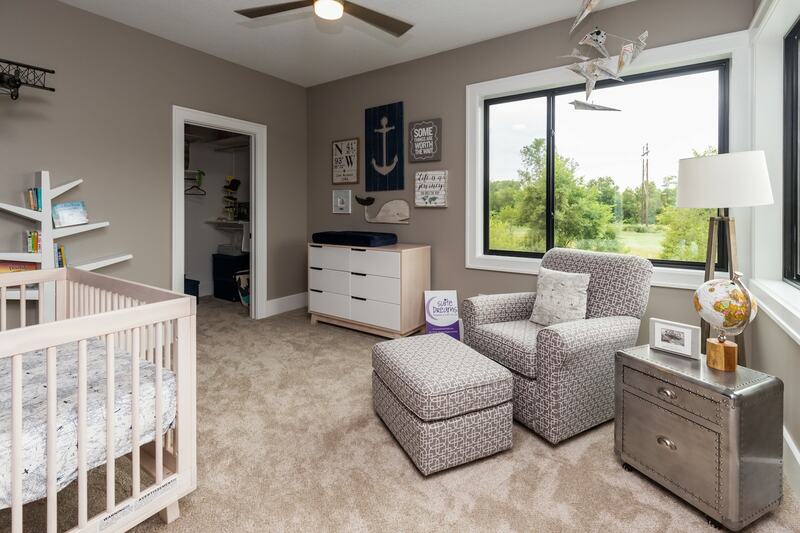 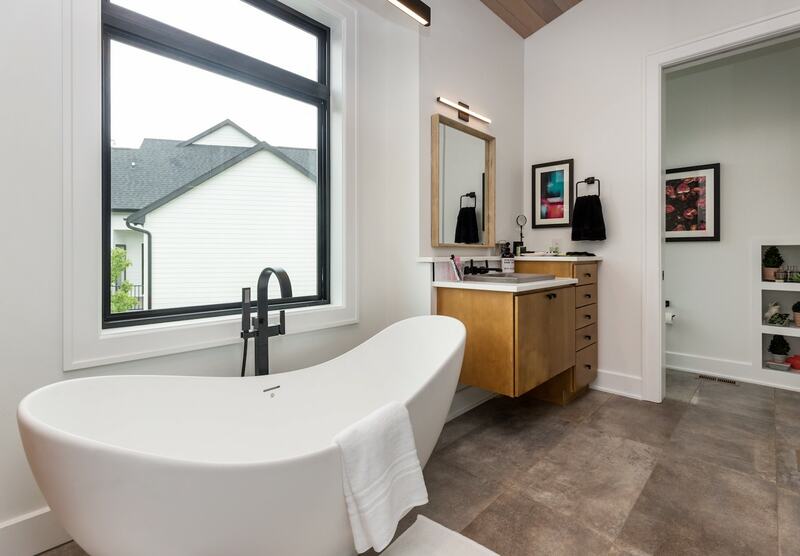 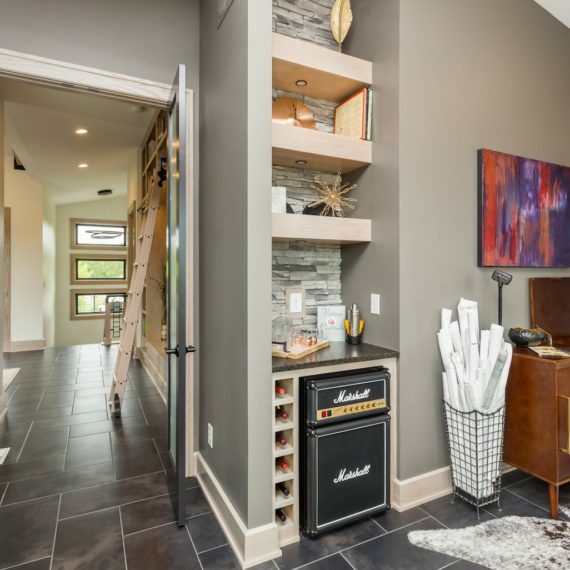 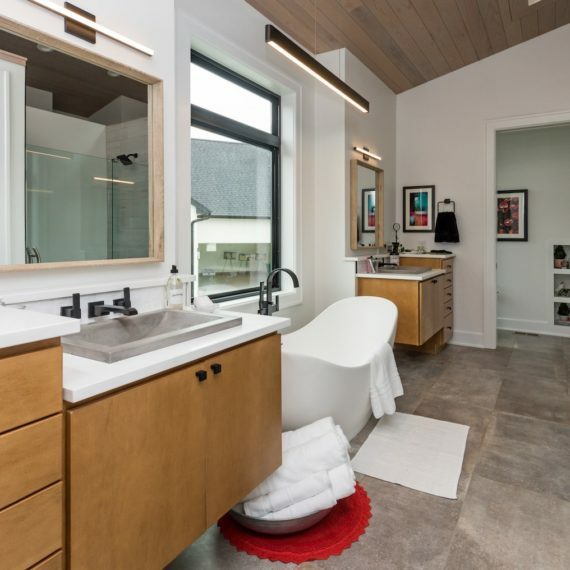 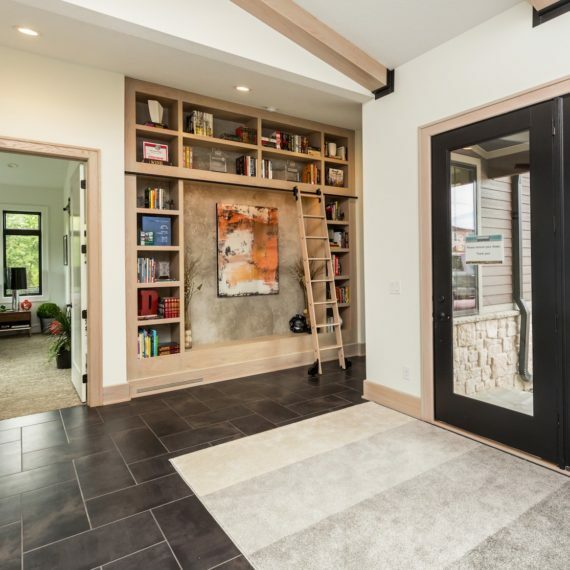 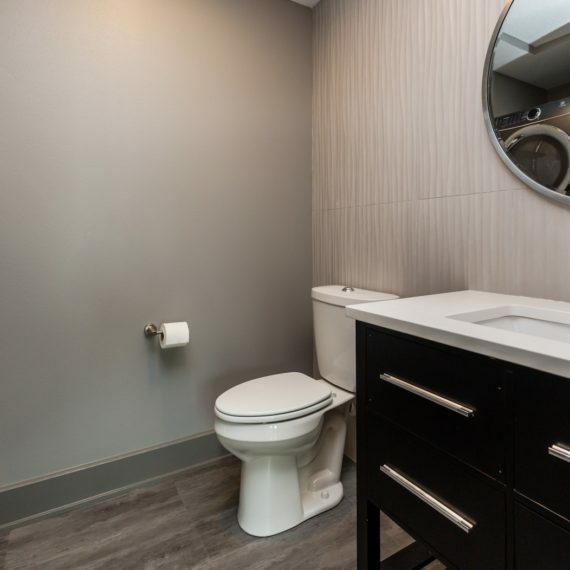 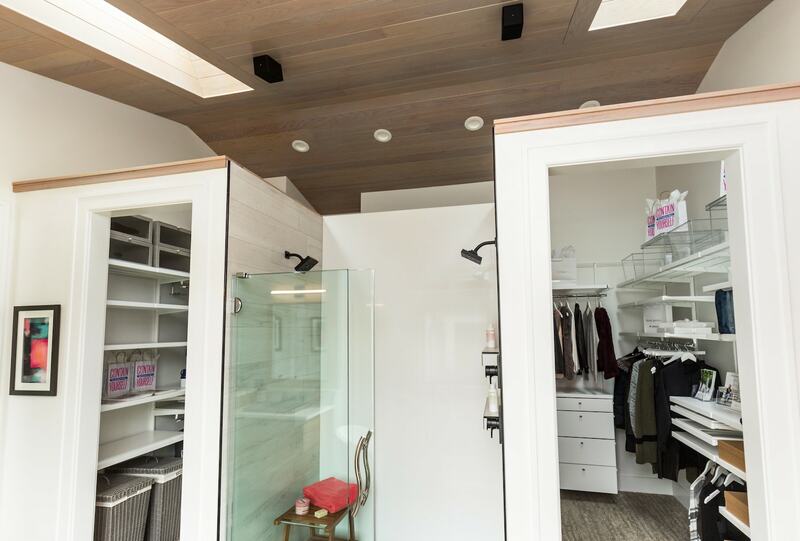 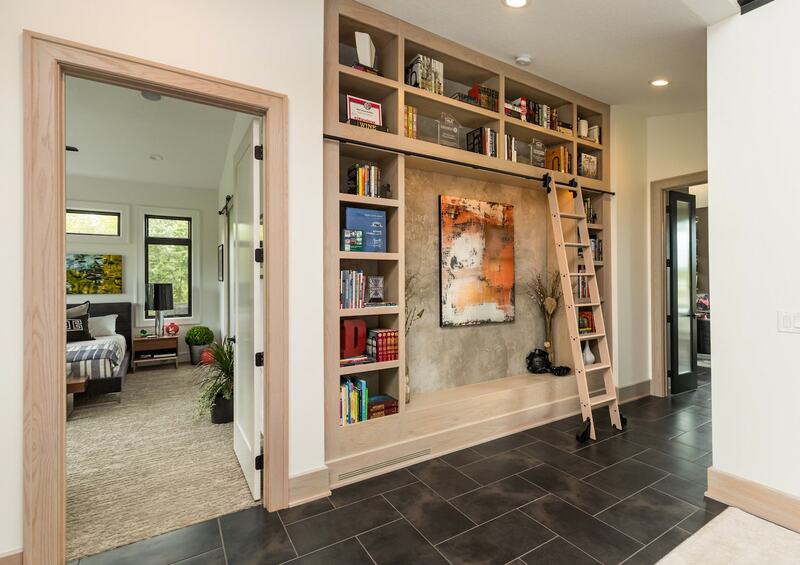 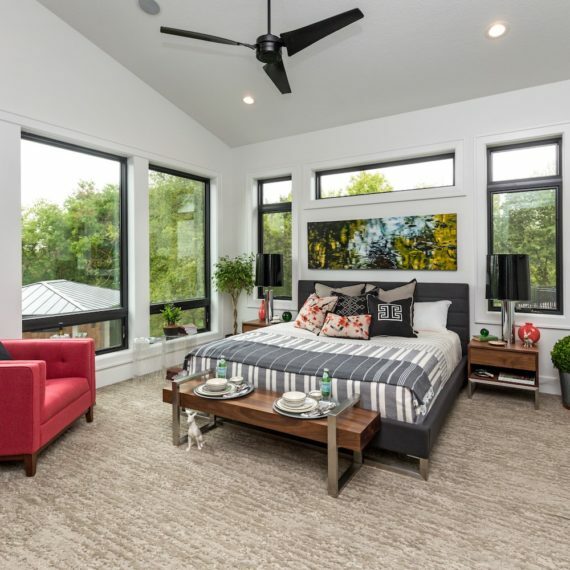 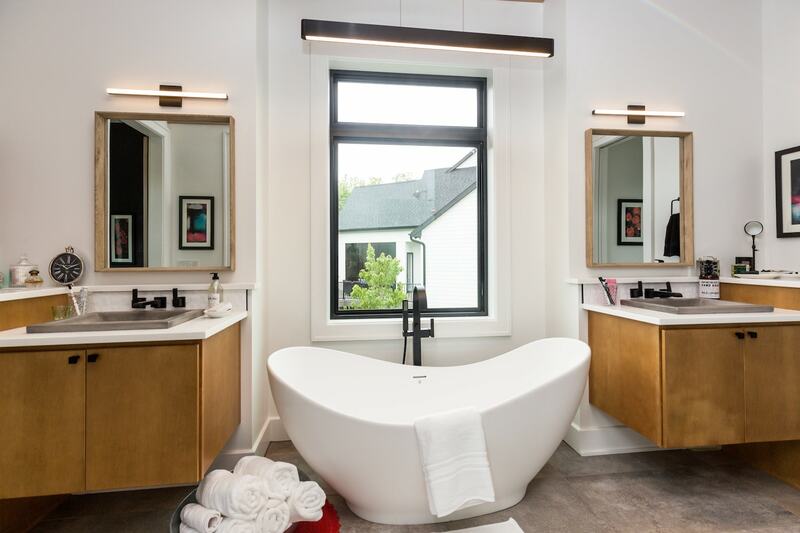 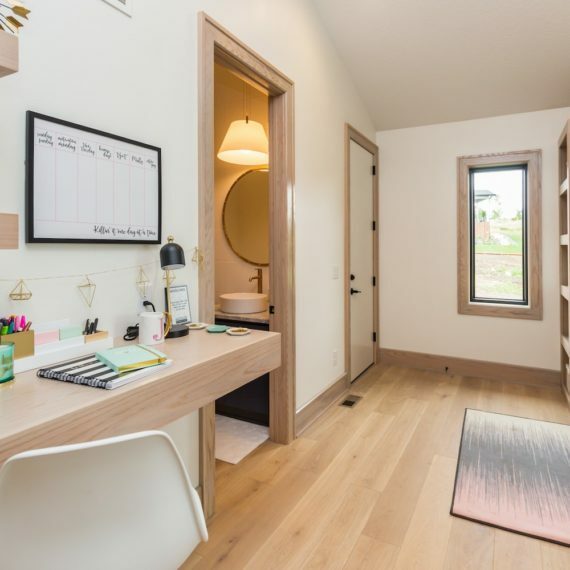 The chic yet industrial master is private with low-pitched vaulted ceilings, an extra large wrap around walk-in closet, a master shower with a 3 sided glass surround and soaking tub. 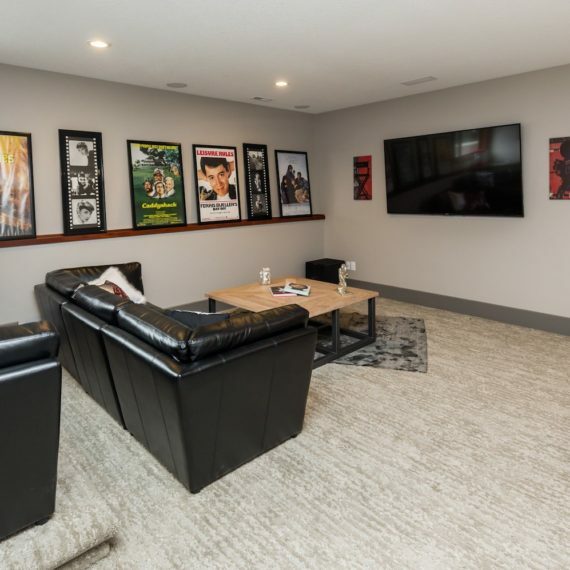 You’ll enjoy the seclusion of the flex/office complete with an art gallery wall and the jack and jill suite just a few steps higher than the main floor. 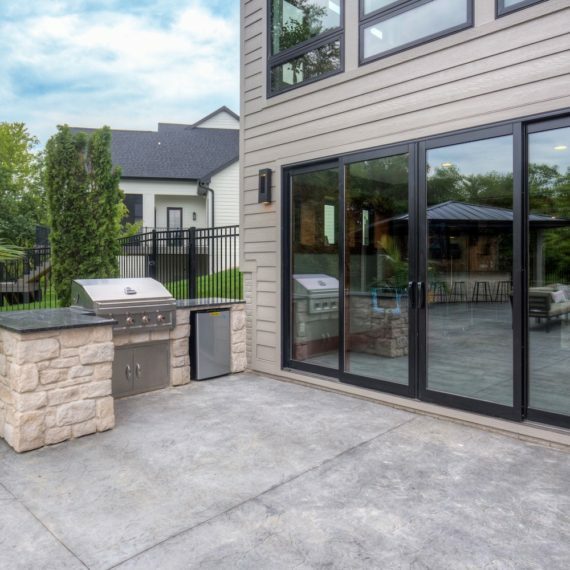 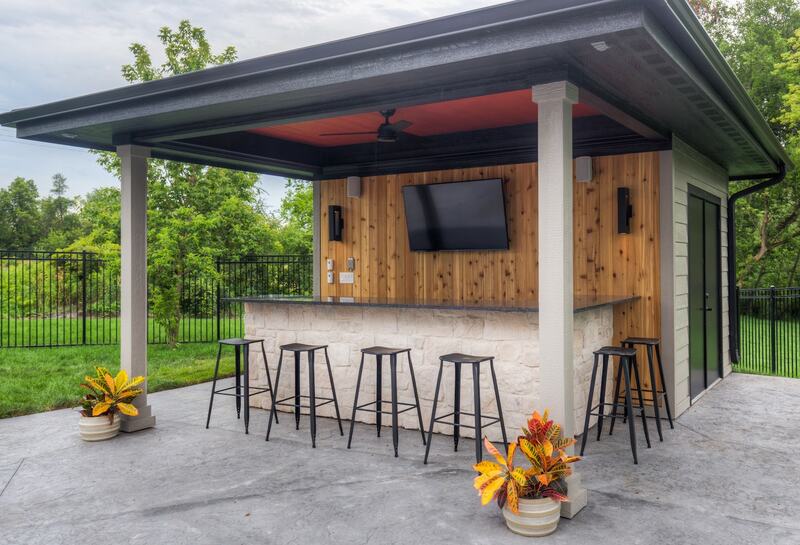 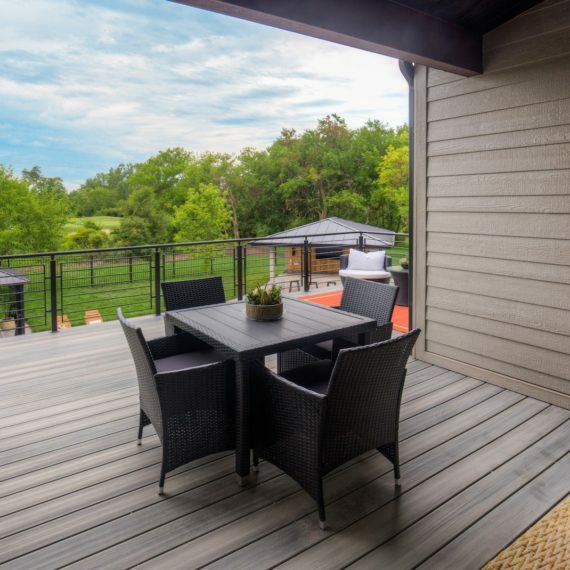 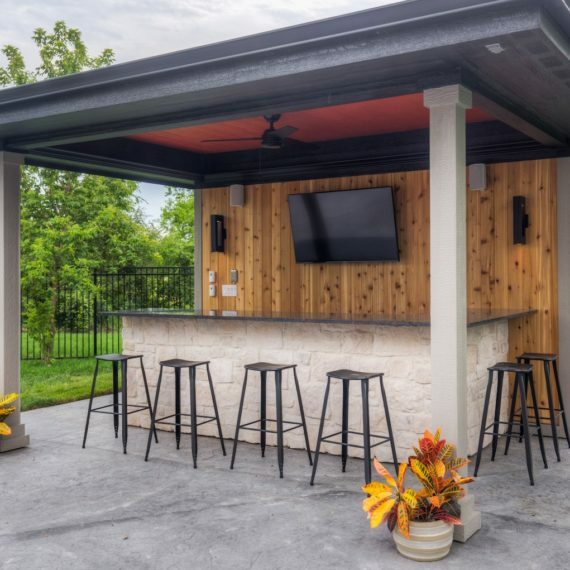 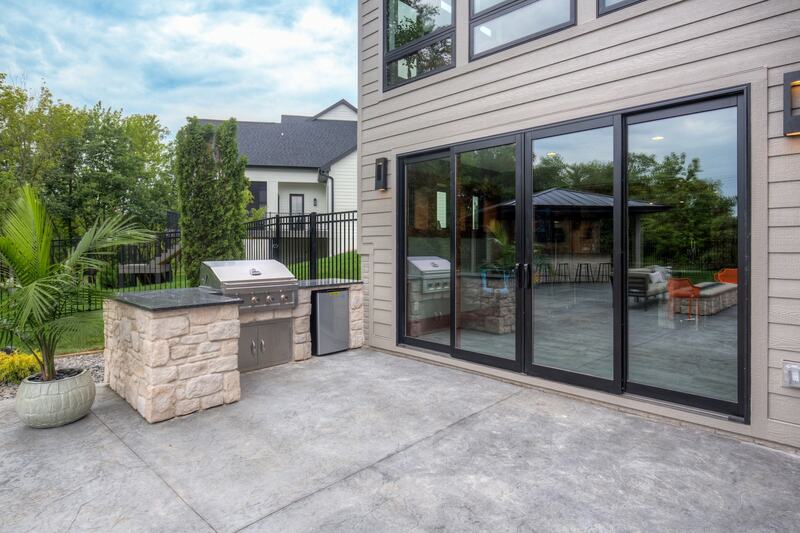 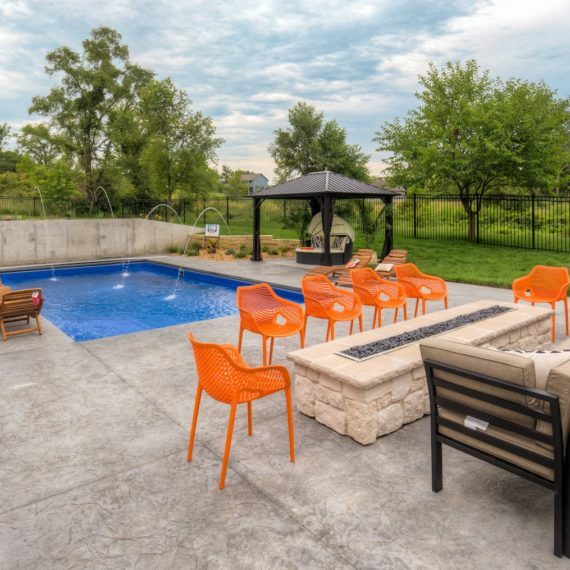 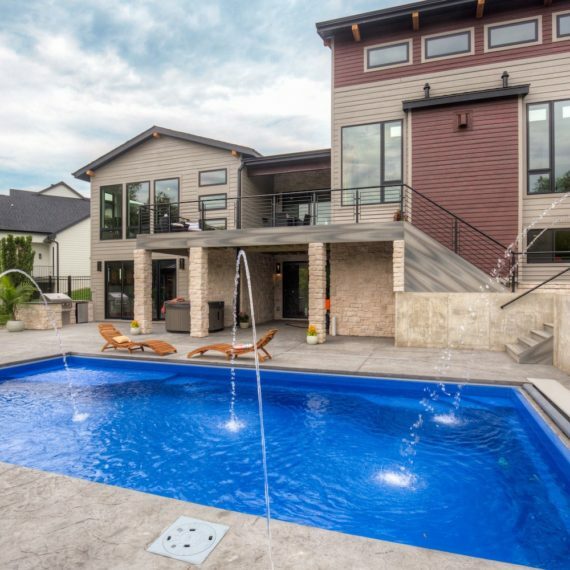 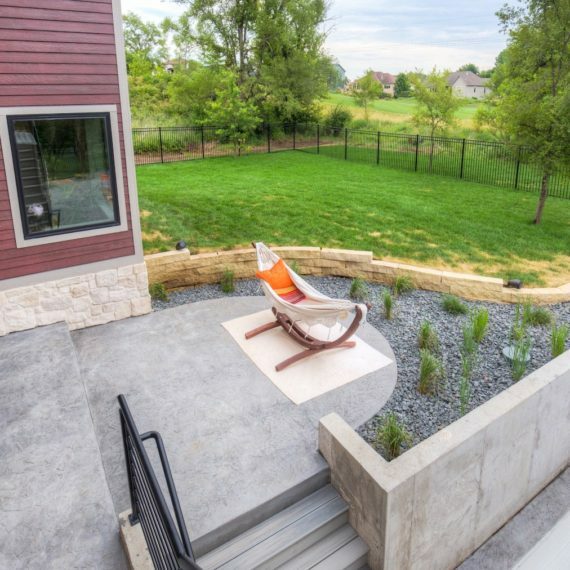 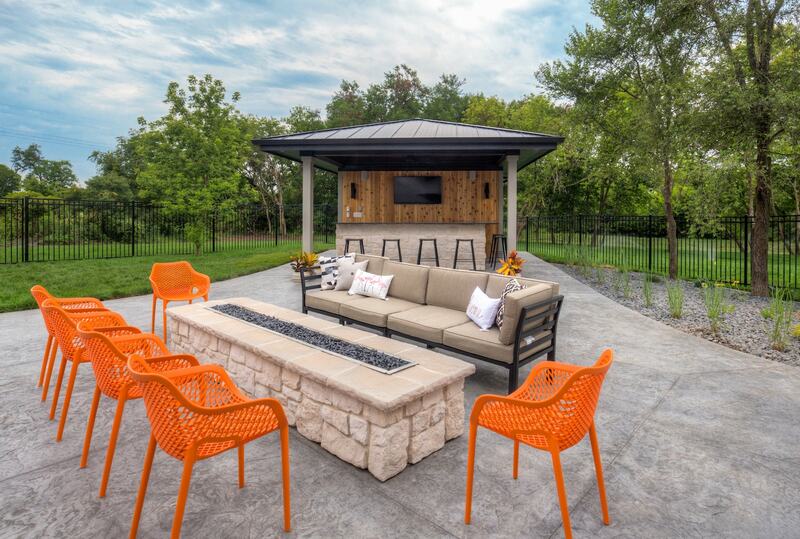 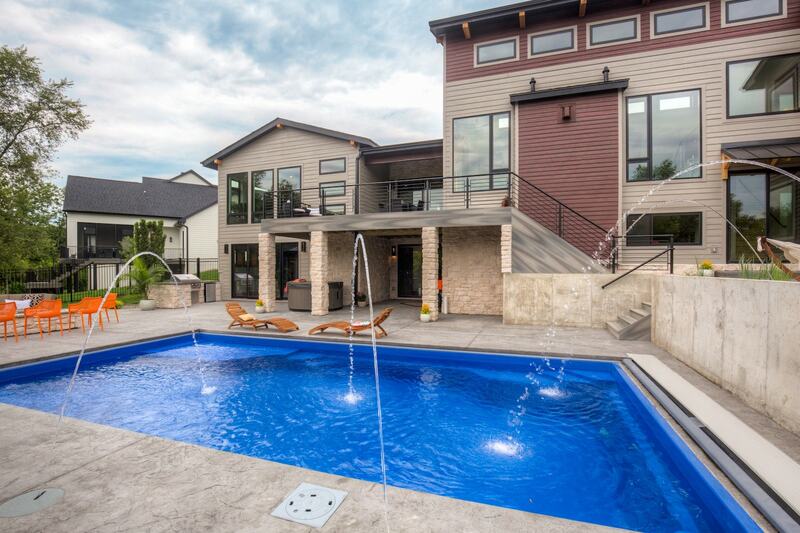 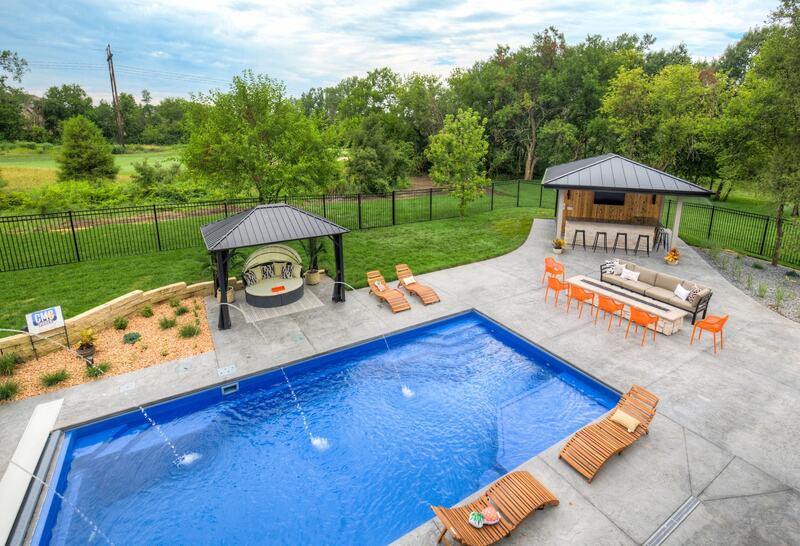 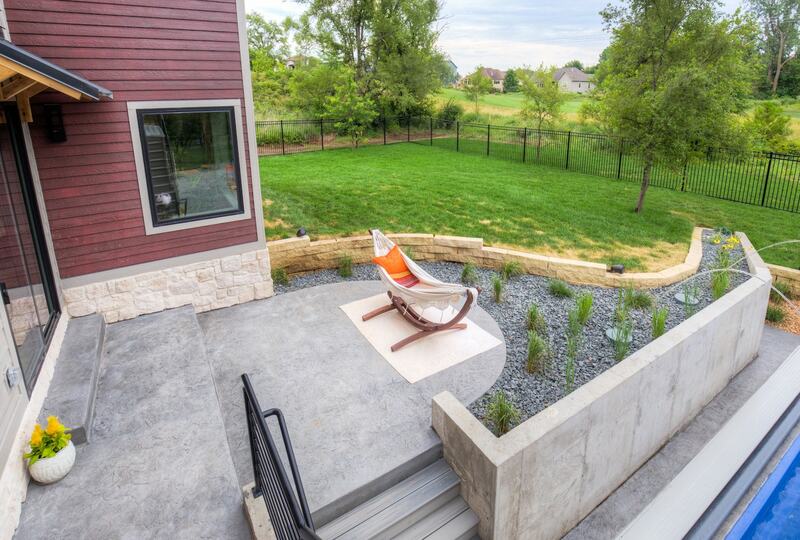 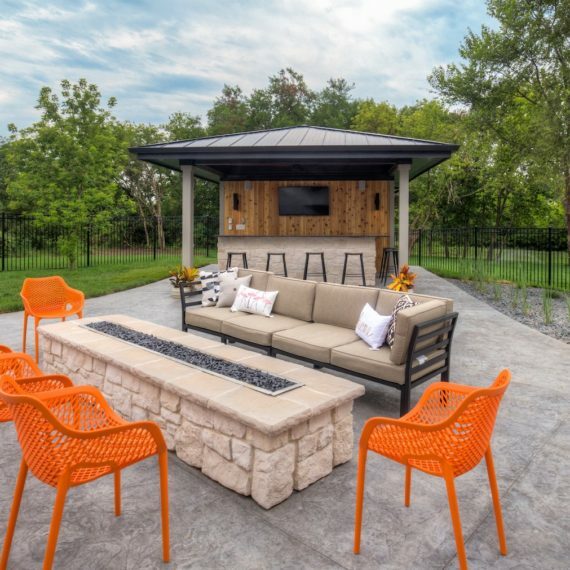 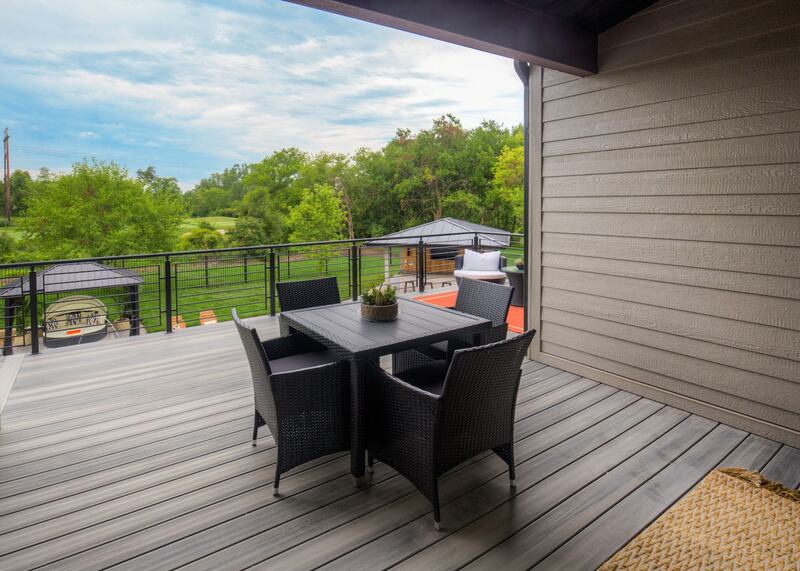 The multi-level outdoor living is designed with a partially covered deck, expansive patio, bar, golf cart garage, fire pit, outdoor kitchen and cabana complete with a hot tub and a heated, salt water pool. 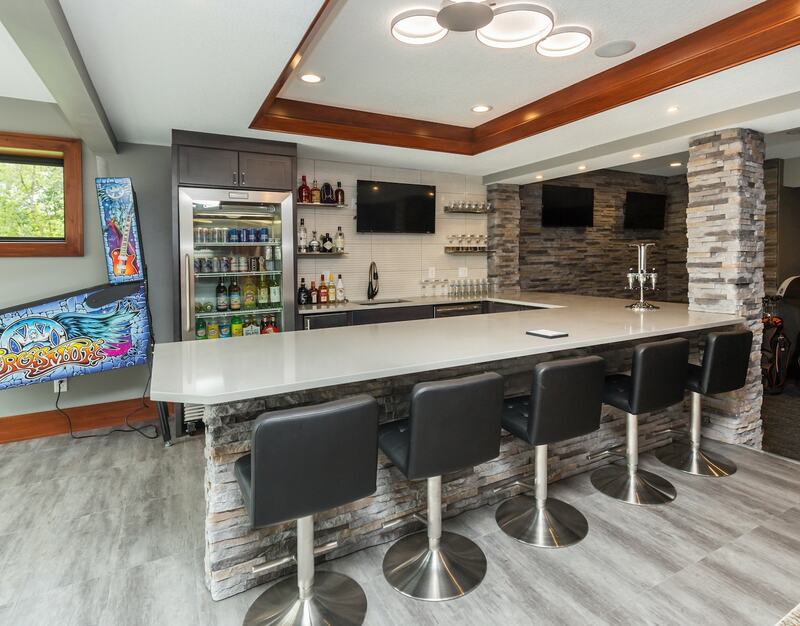 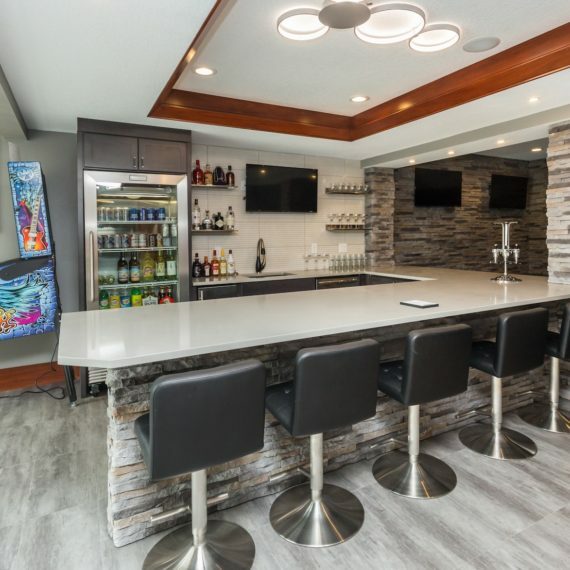 The lower level has a bar area that’s designed to feel like an exclusive country club featuring plenty of seating, TVs and a golf simulator. 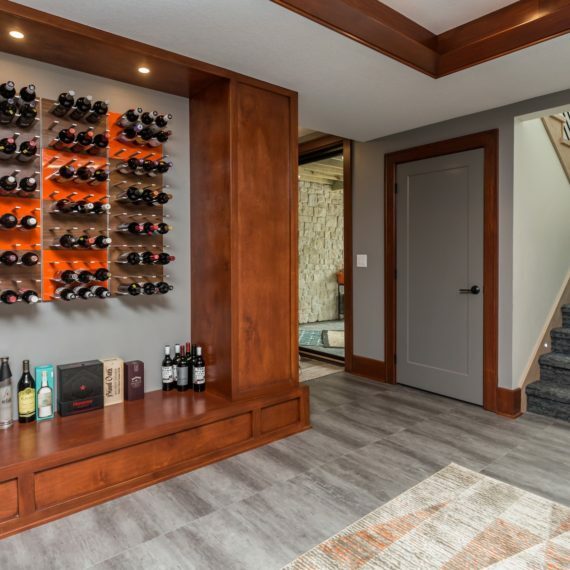 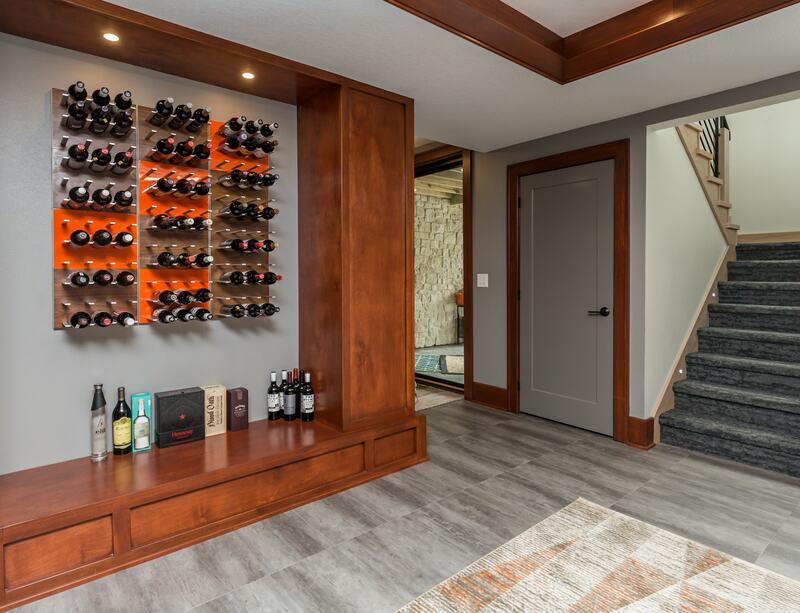 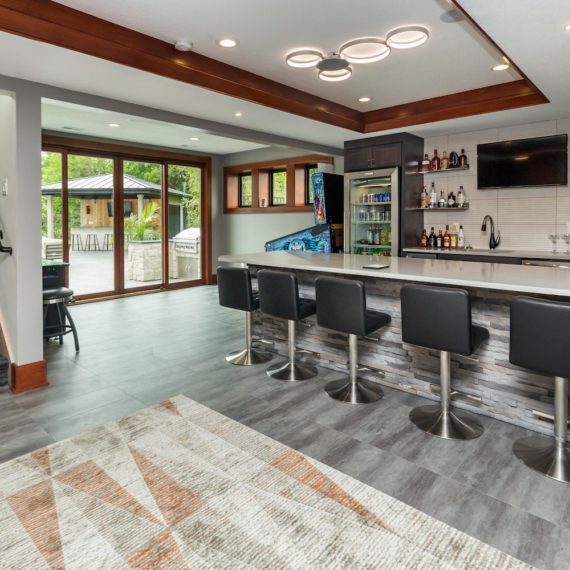 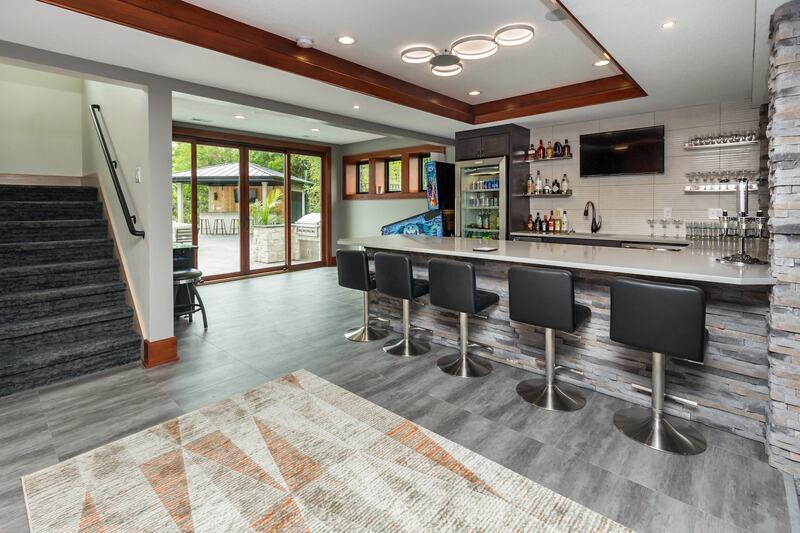 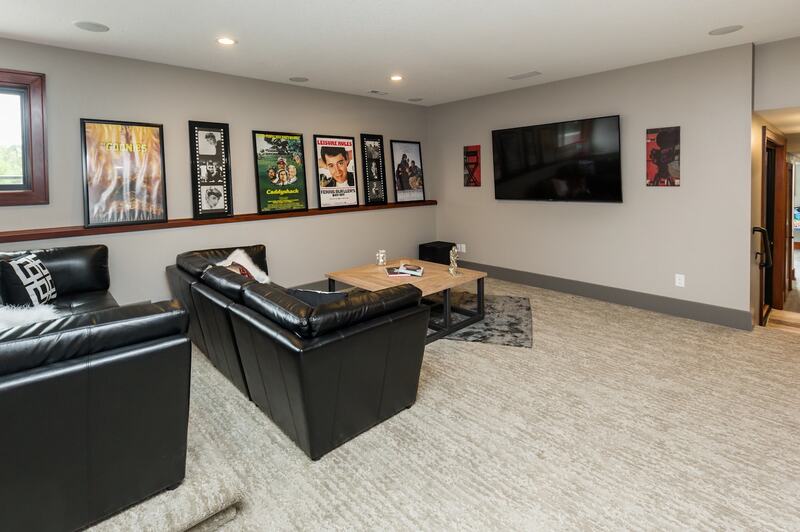 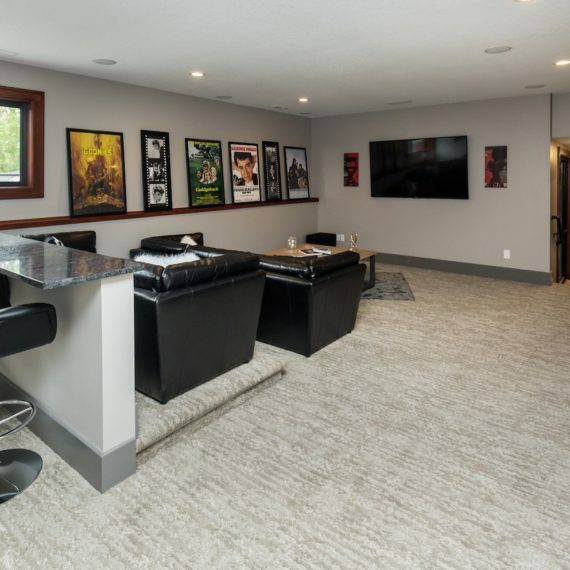 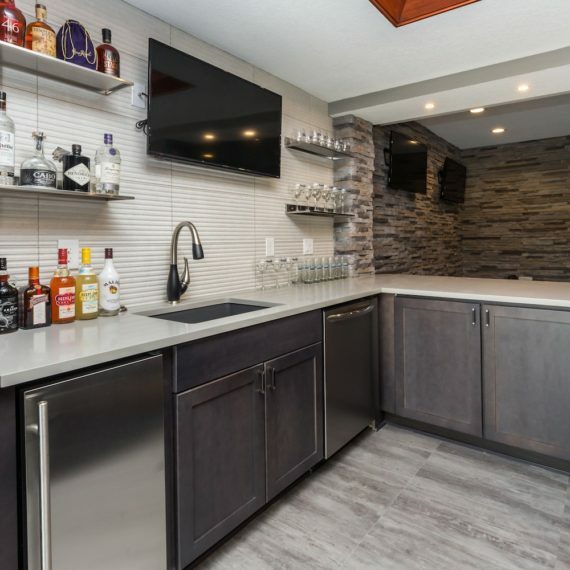 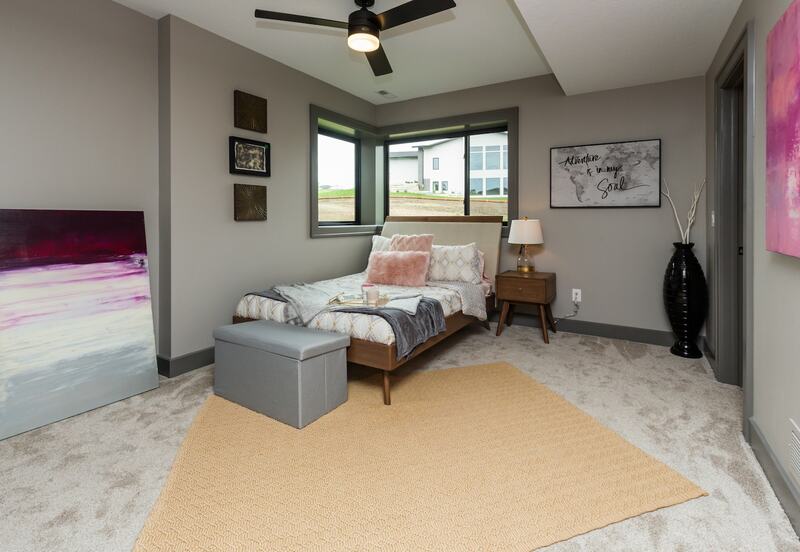 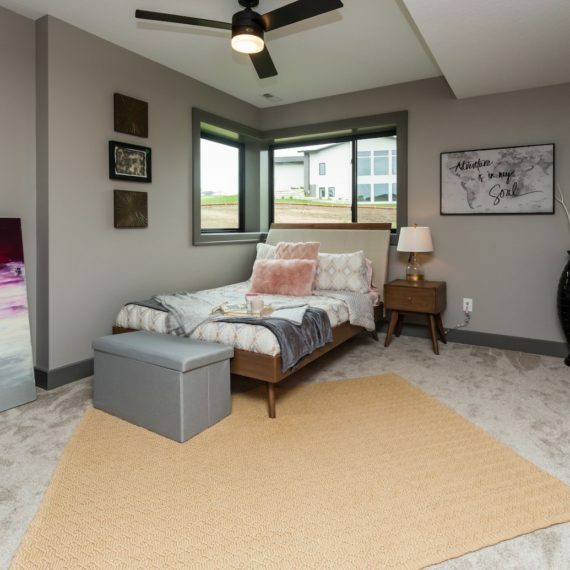 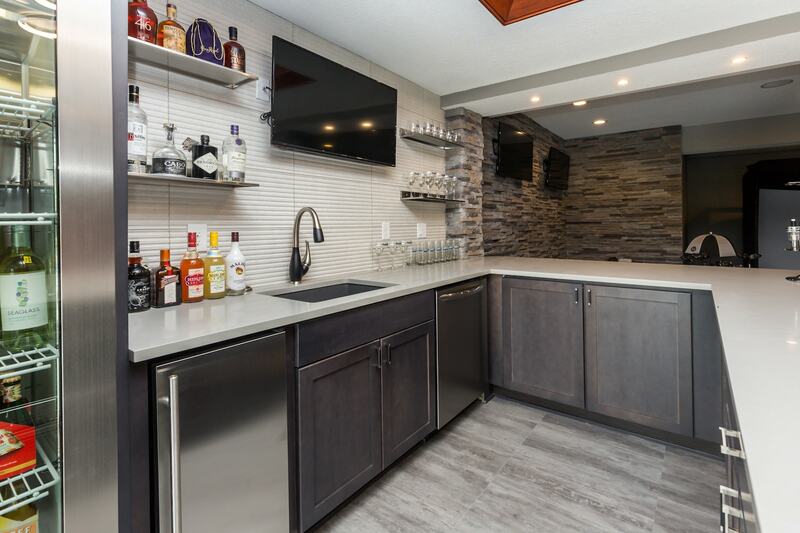 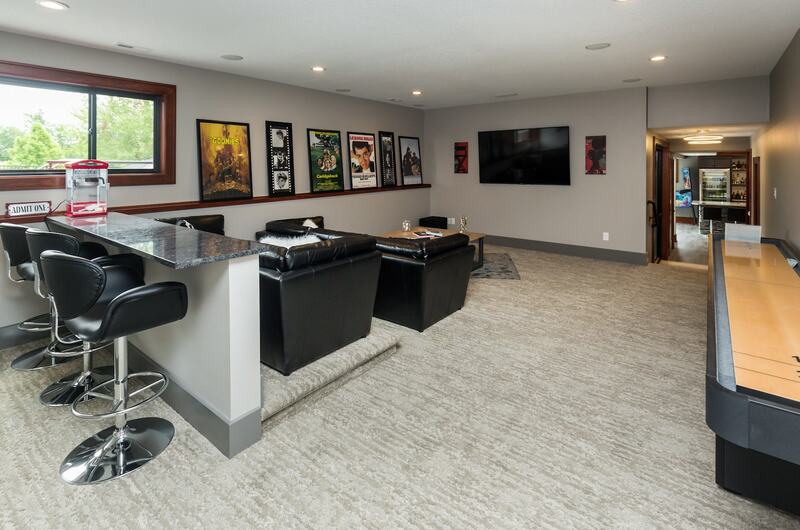 With a theatre room living area, en suite/living room perfect for guests, in-laws and teens and a future gym/game/crafts room, this walkout basement leaves nothing else to ask for. 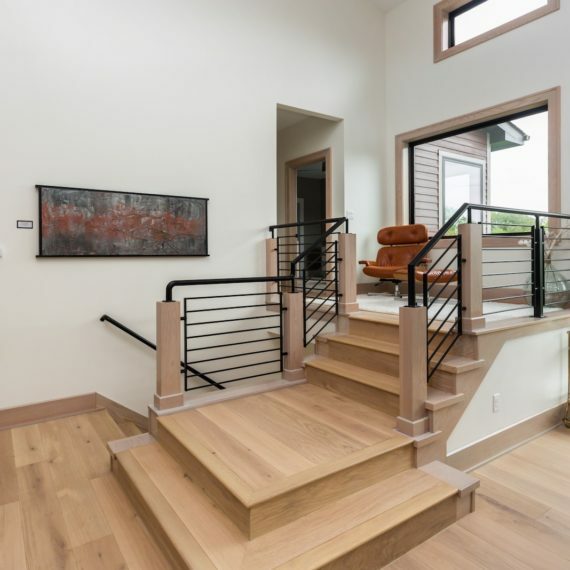 Other features include 2 sets of stairs, upgraded lighting and electrical, surround sound, mission control drop zone, pantry grocery door, entry bench, double entry door, art gallery/library ladder and much more. 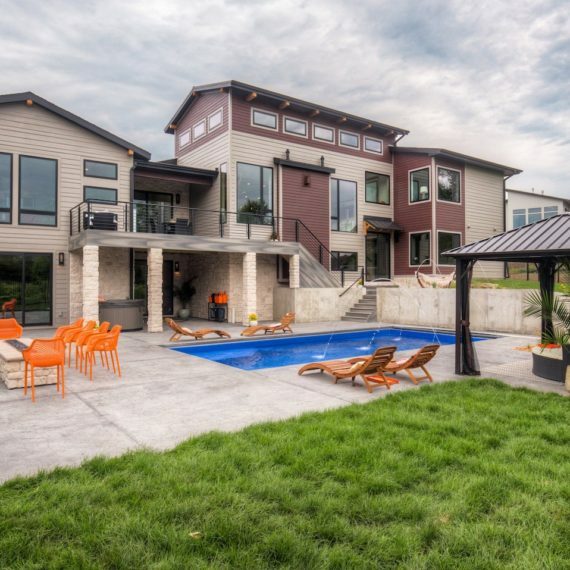 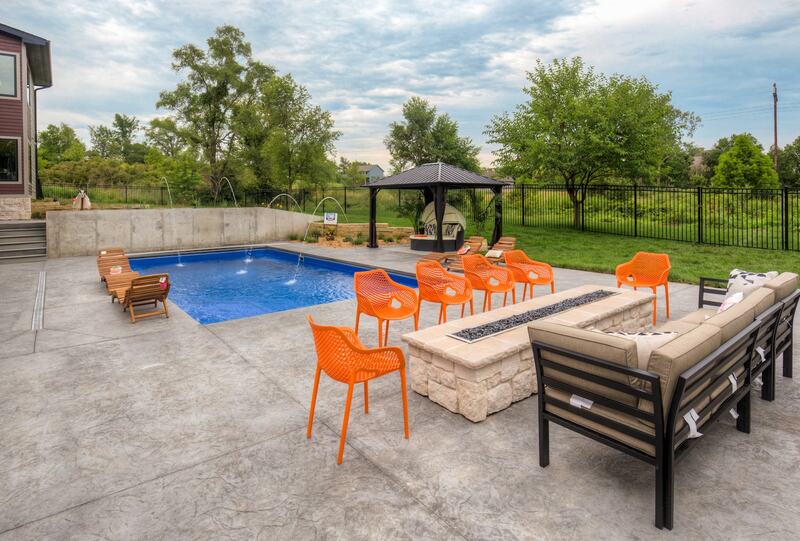 This home was designed to entertain and impress yet still be a comfortable and relaxing retreat!